Mary cutting the sweet treat we brought as a farewell gift. 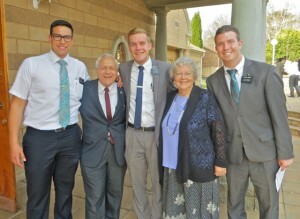 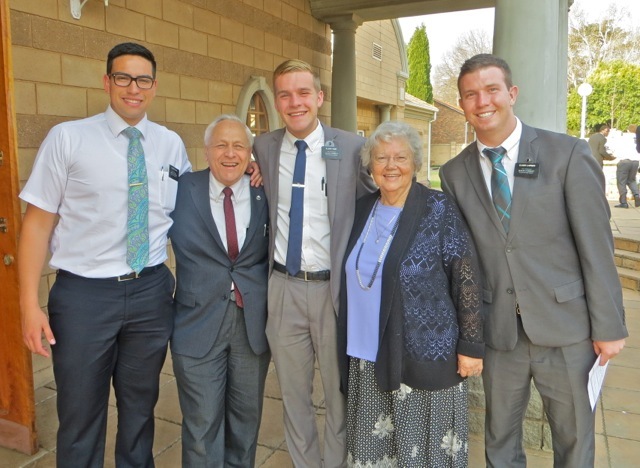 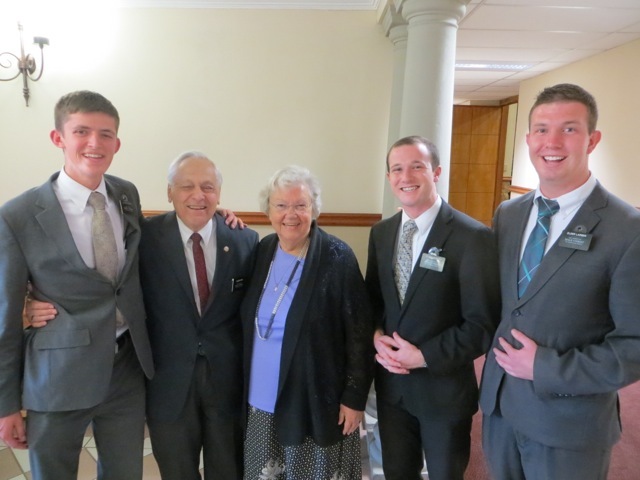 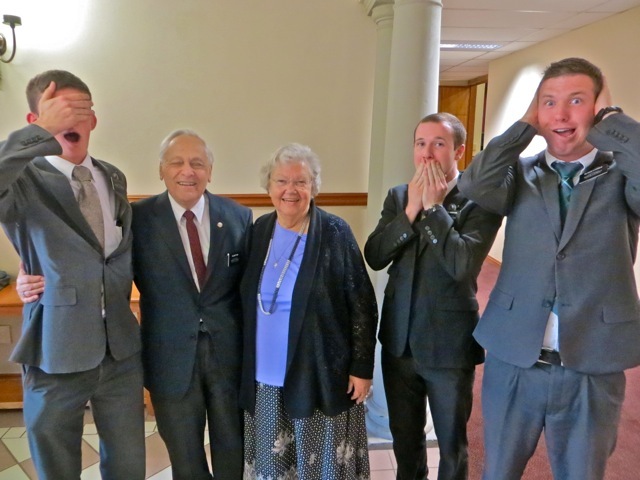 Our last picture with our good friend Sister Bobbi Swanepoel…we were sorry to hear of her passing about 6 months after we got home. 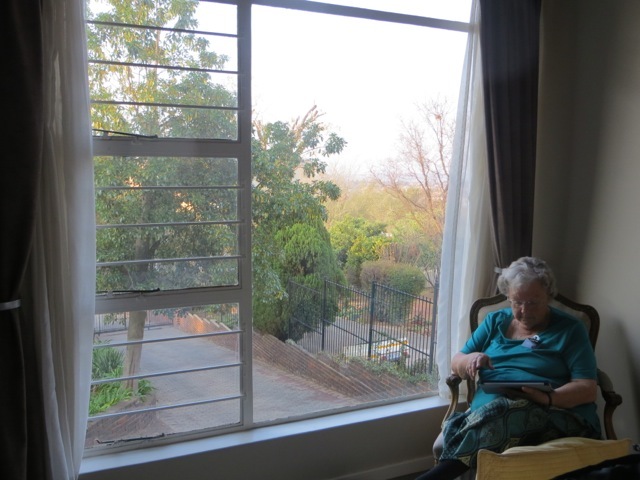 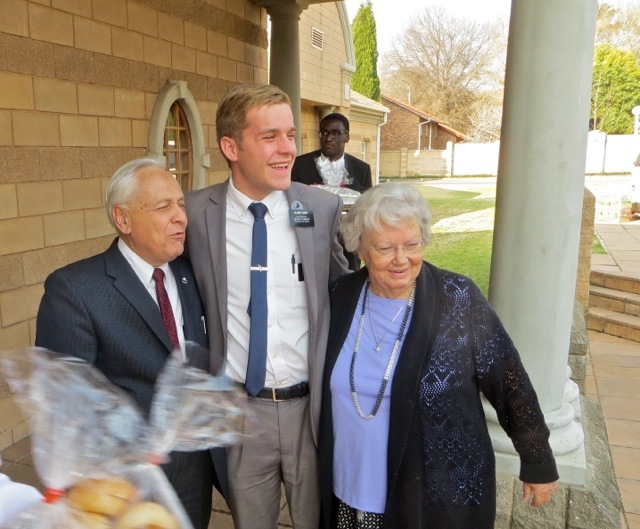 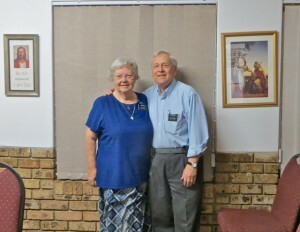 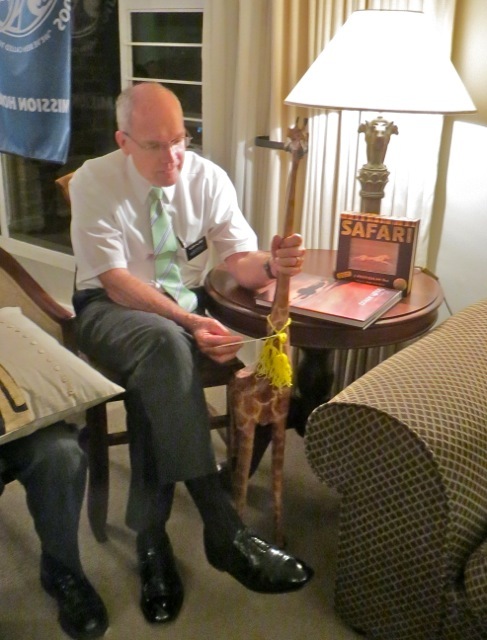 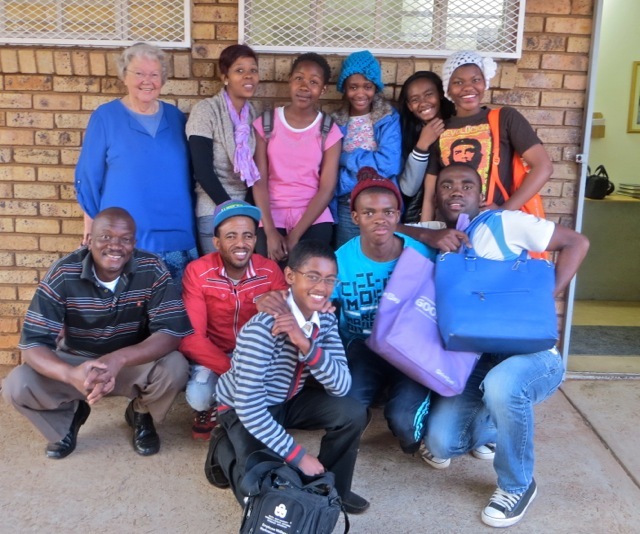 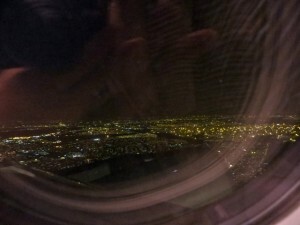 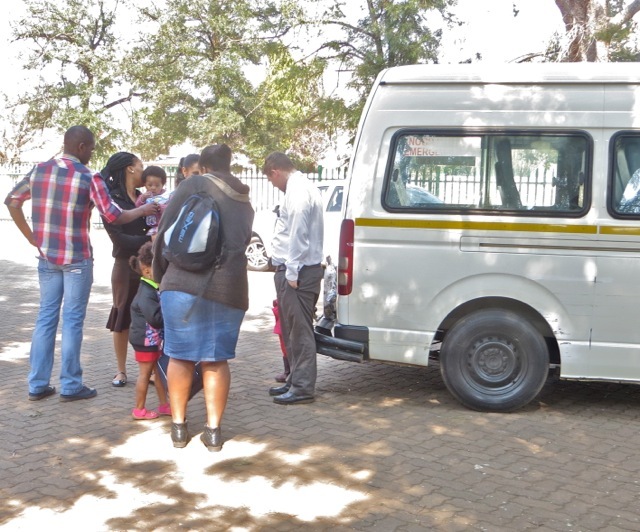 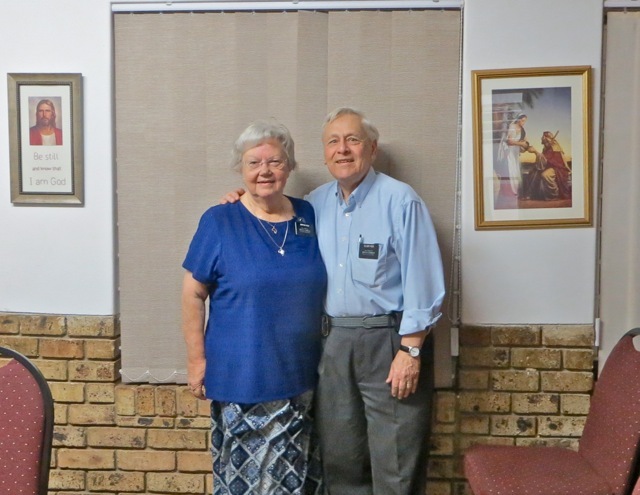 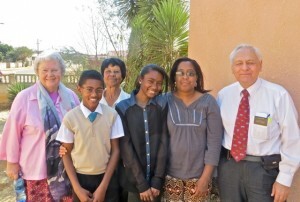 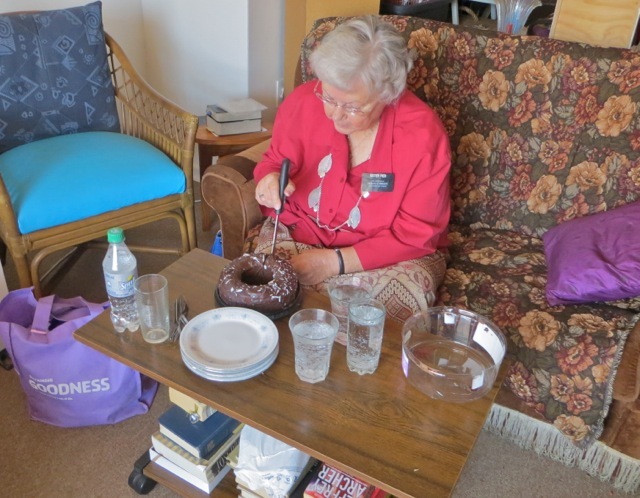 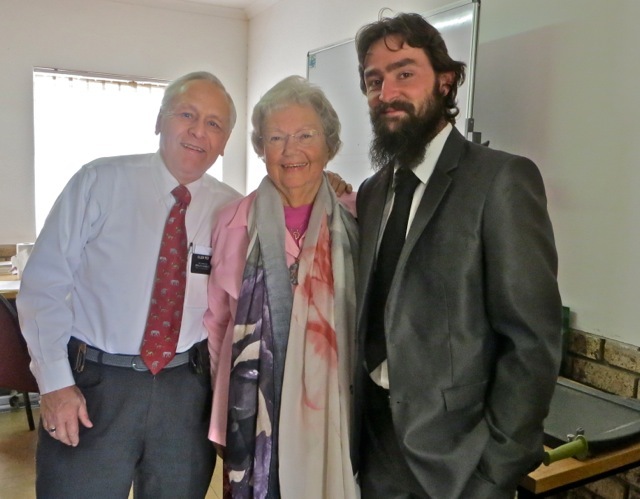 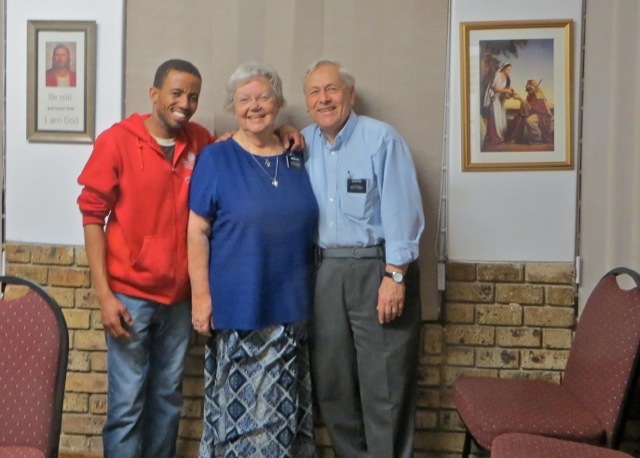 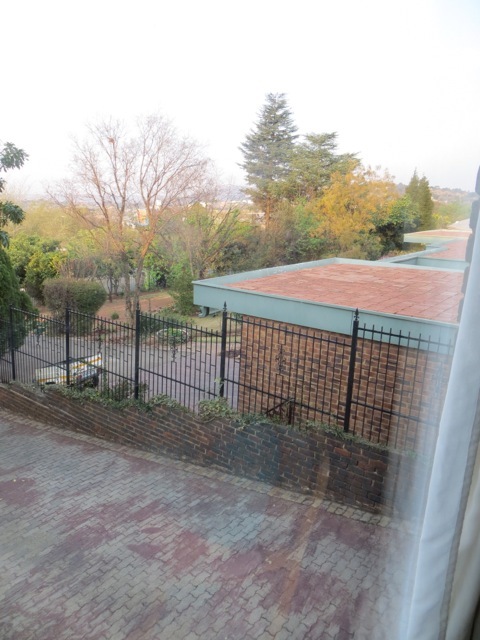 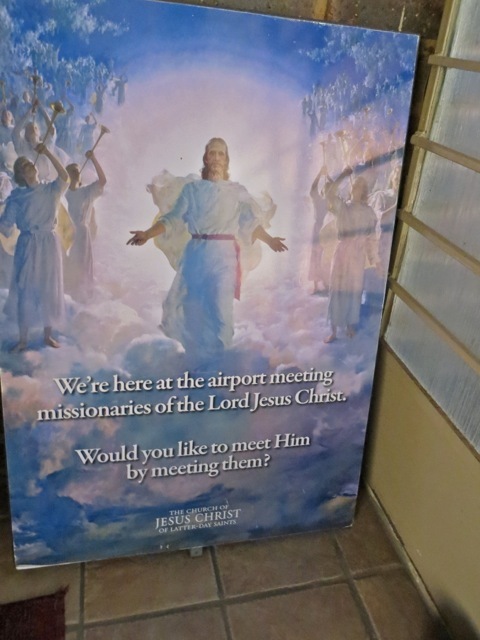 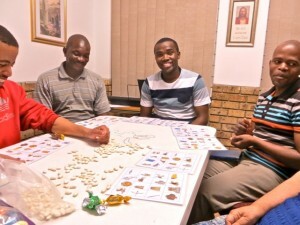 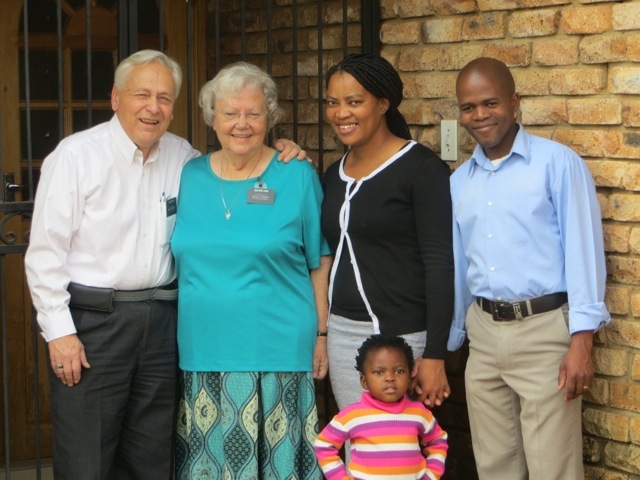 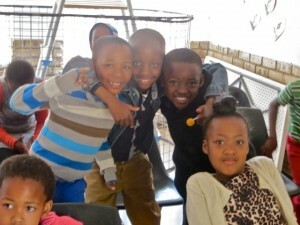 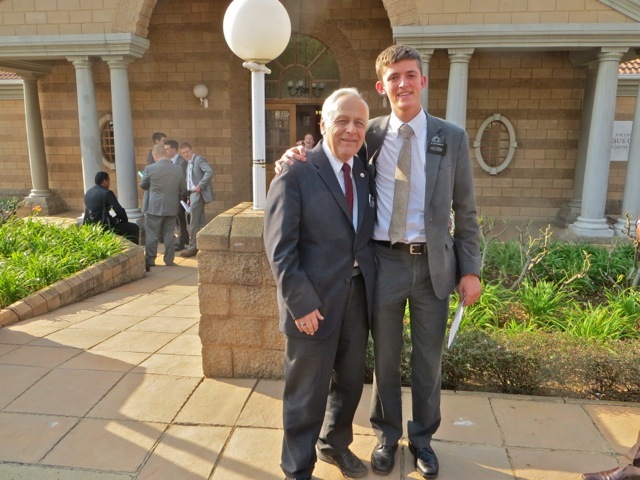 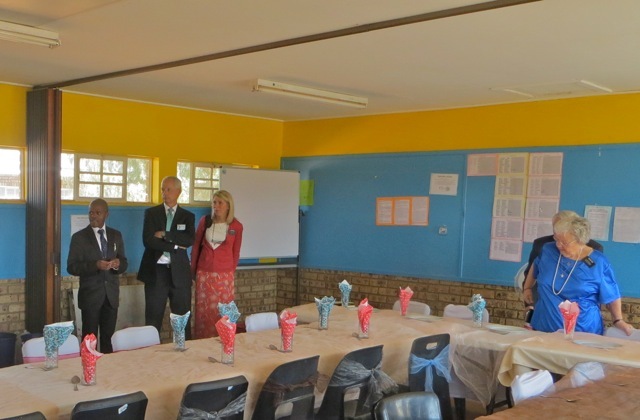 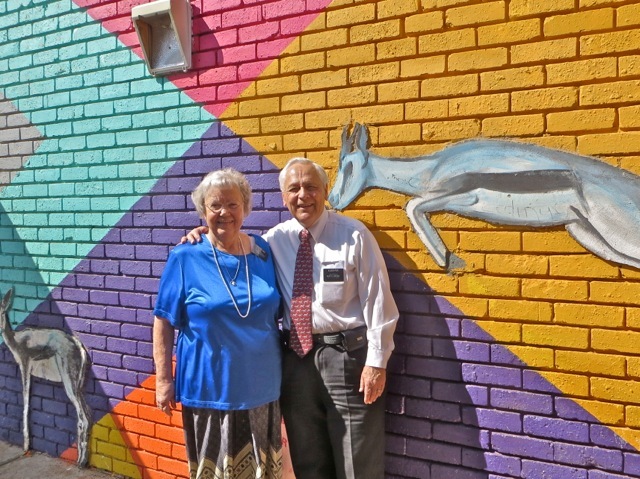 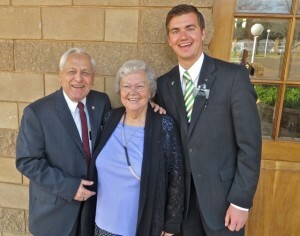 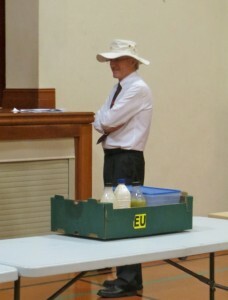 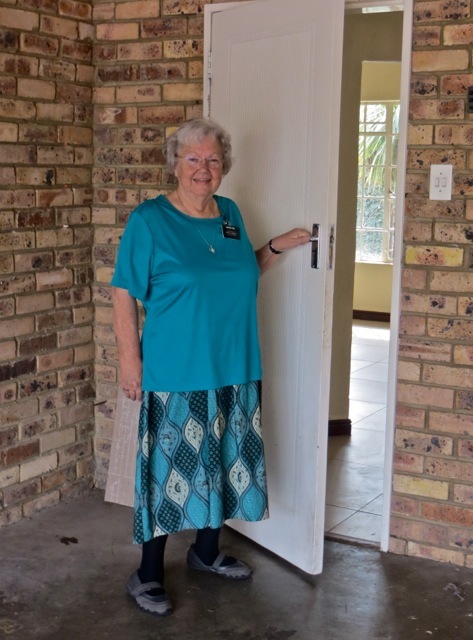 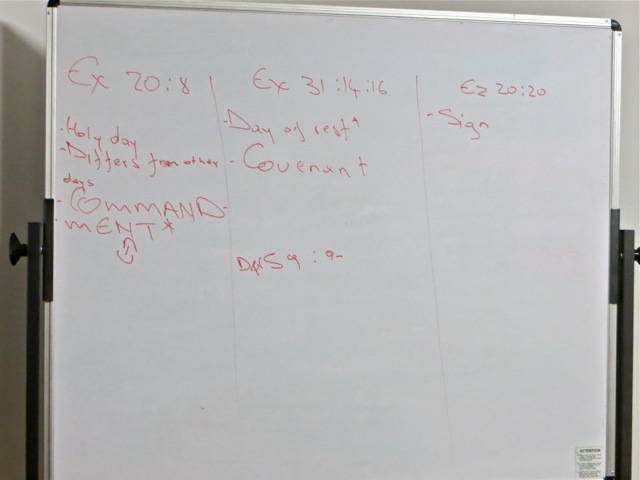 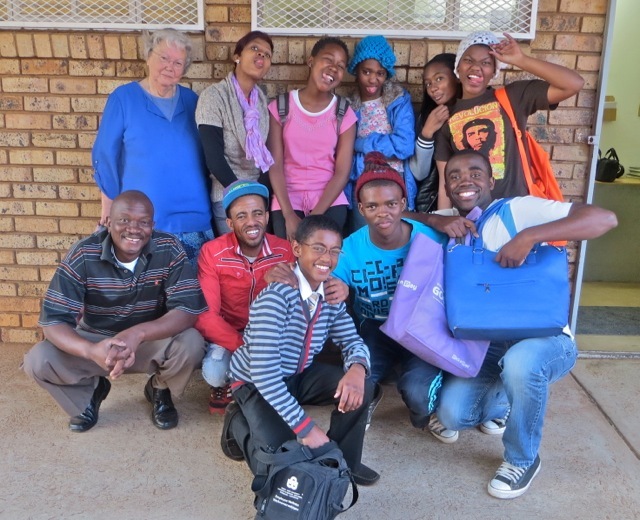 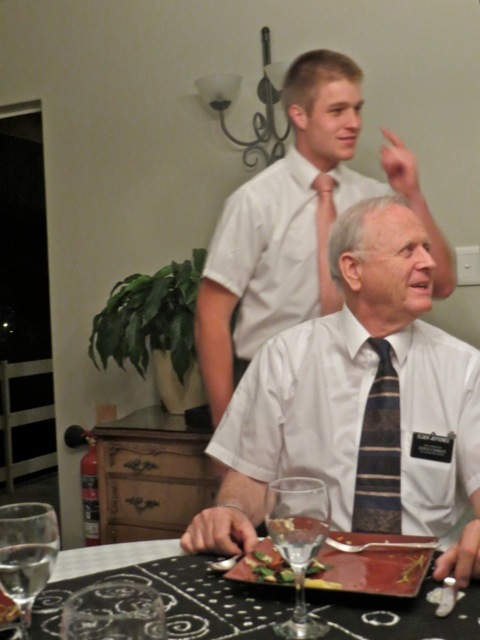 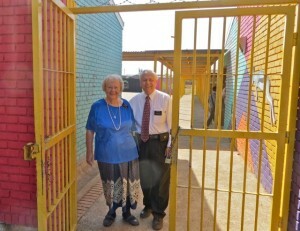 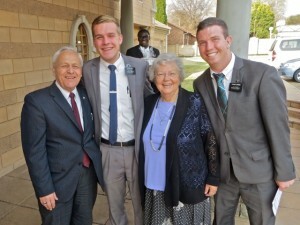 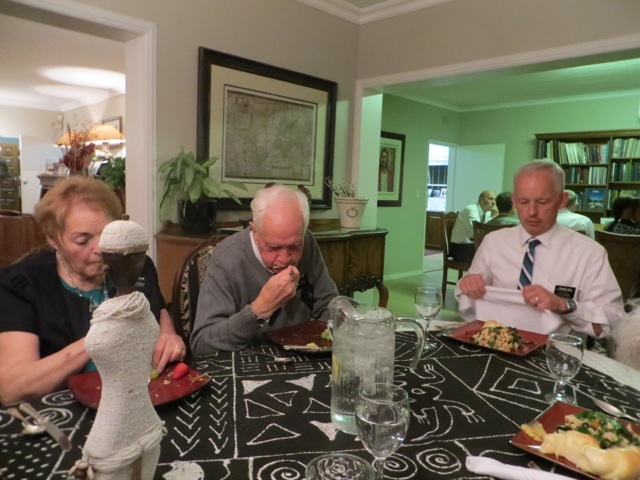 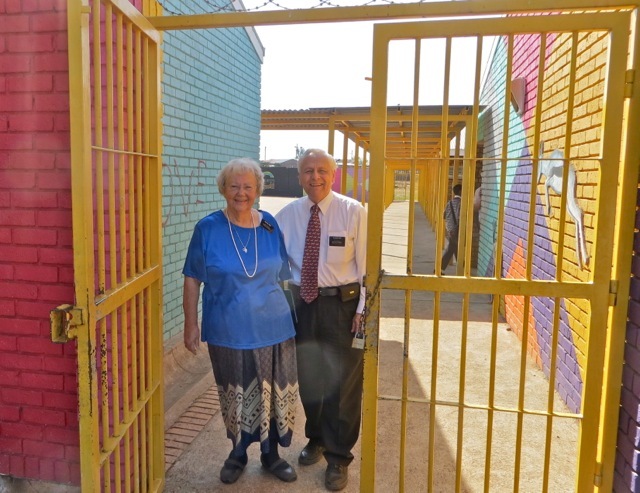 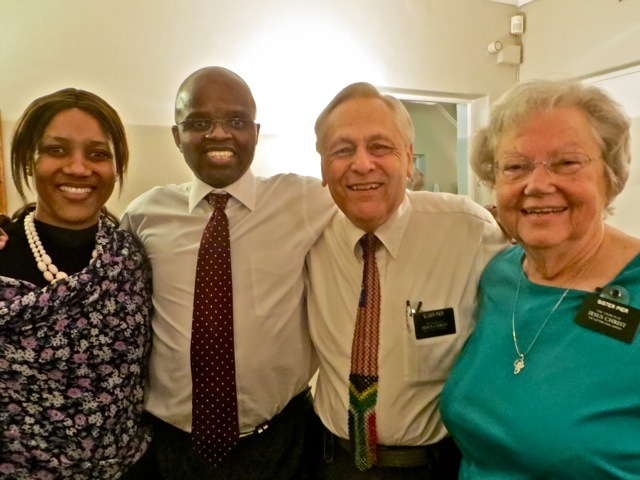 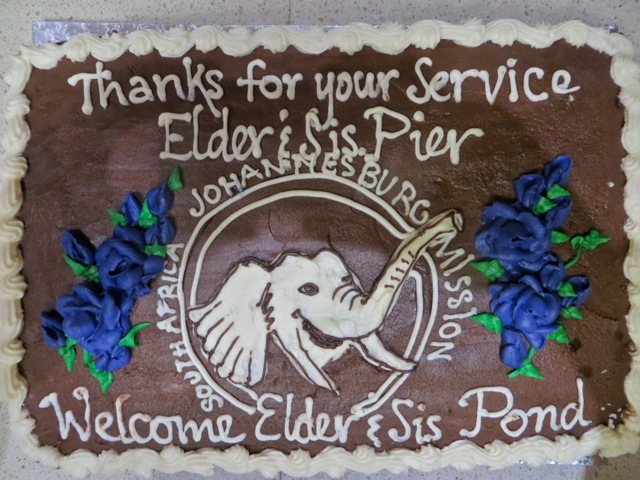 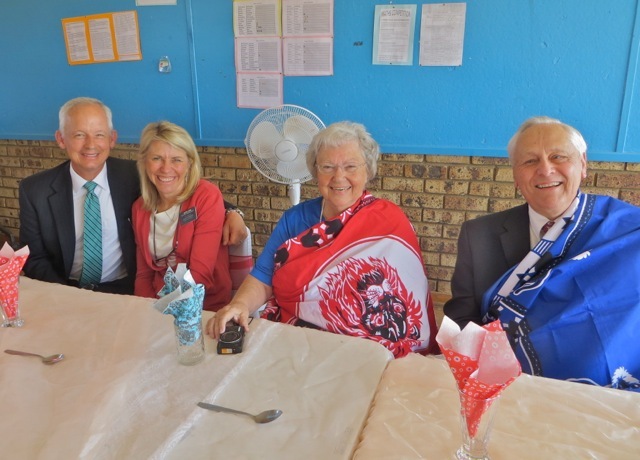 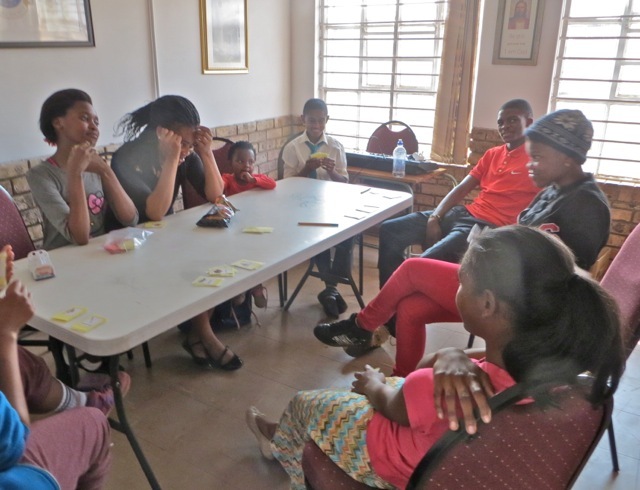 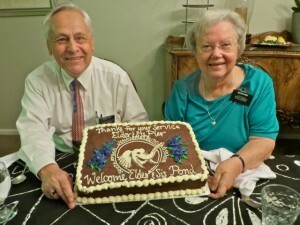 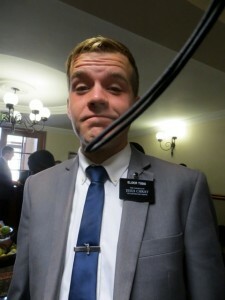 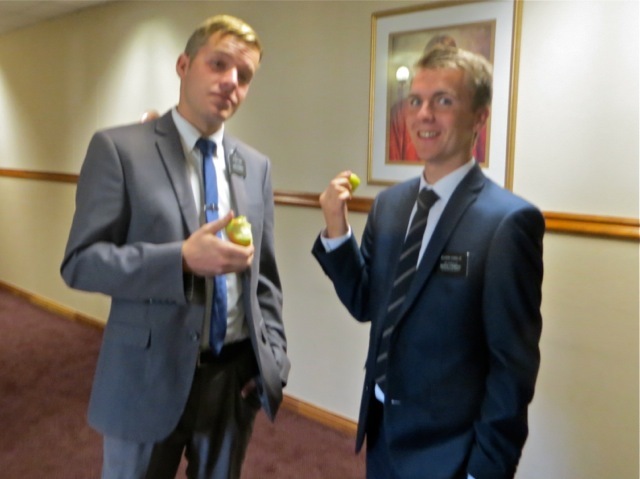 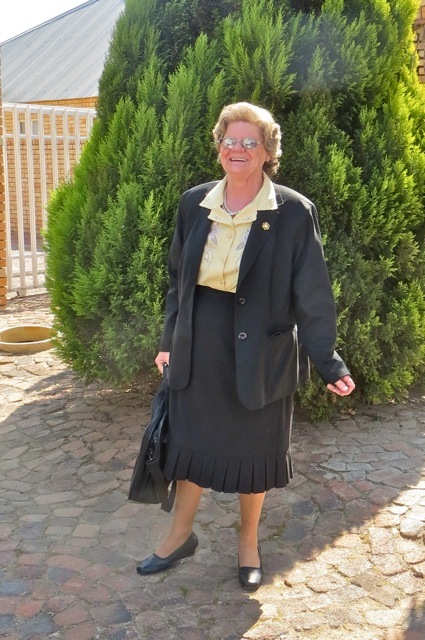 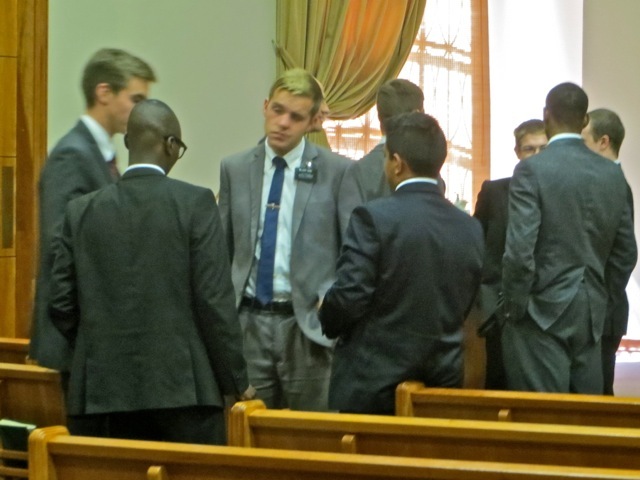 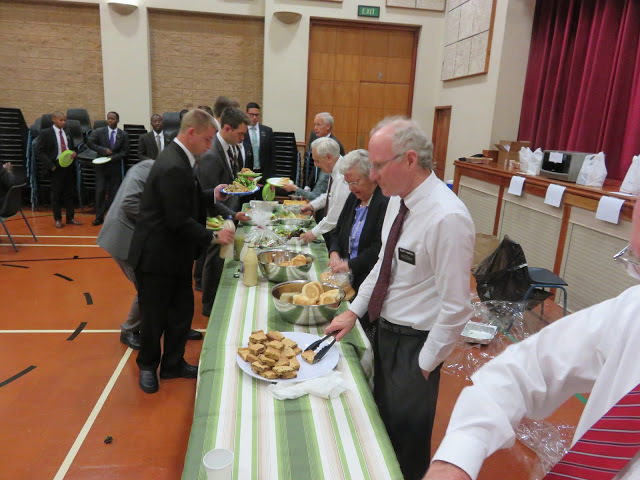 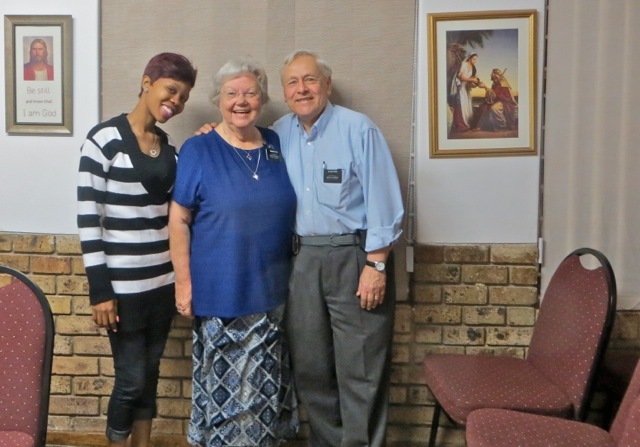 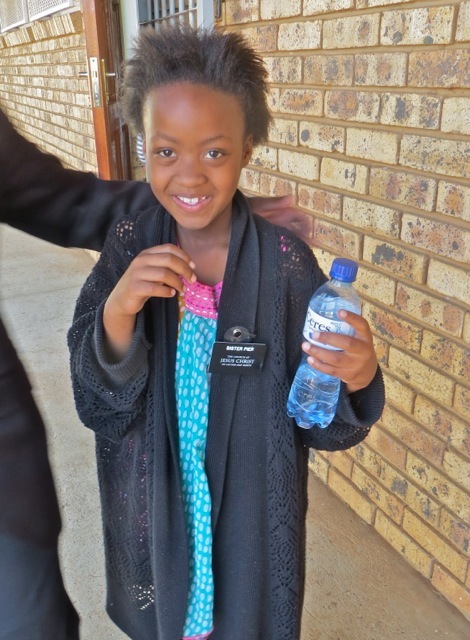 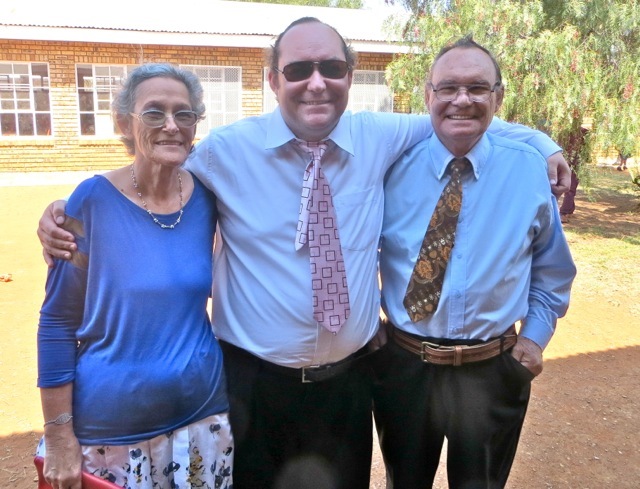 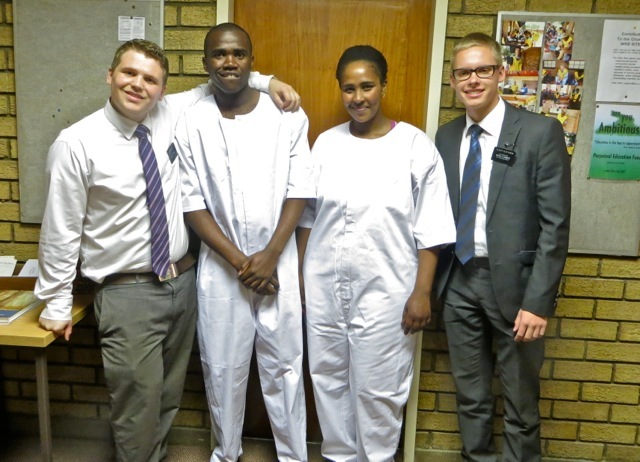 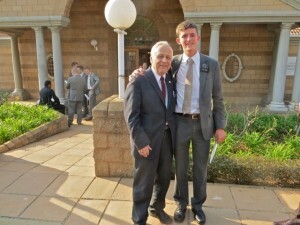 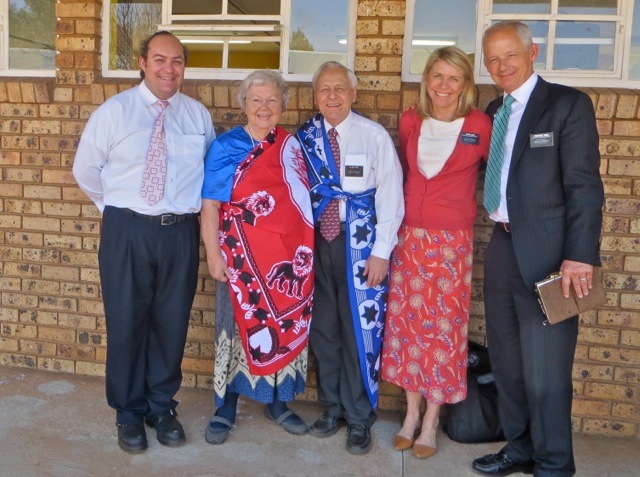 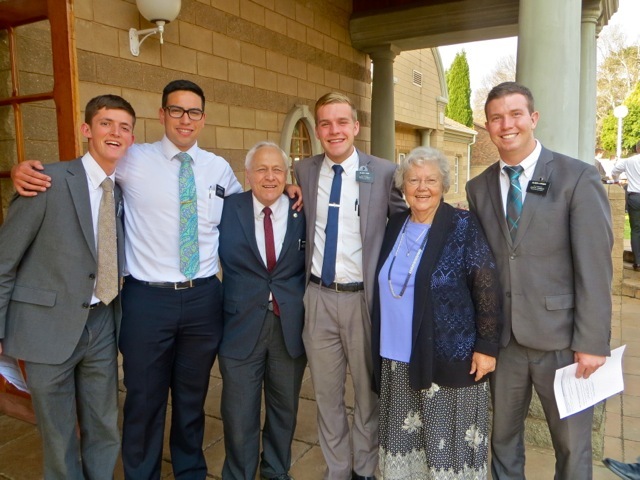 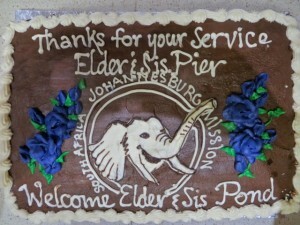 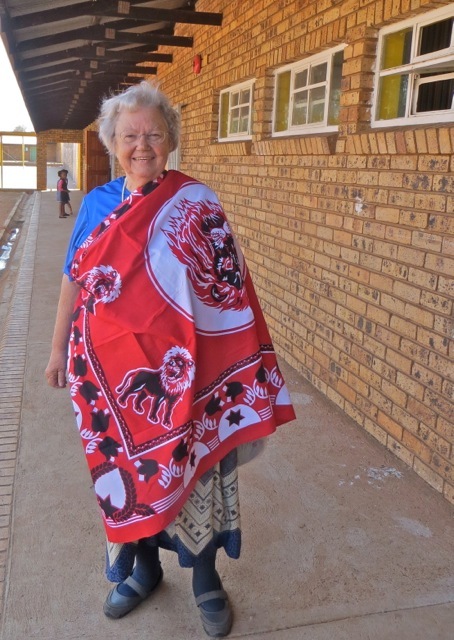 This entry was posted in Johannesburg Mission - Back To Africa on August 19, 2015 by Bill. 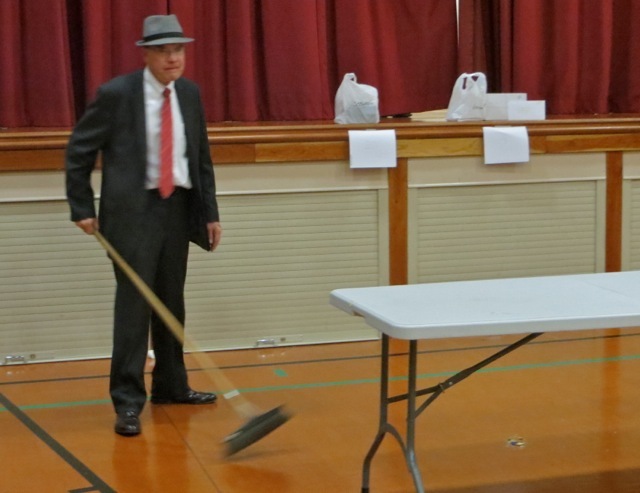 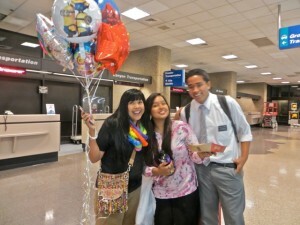 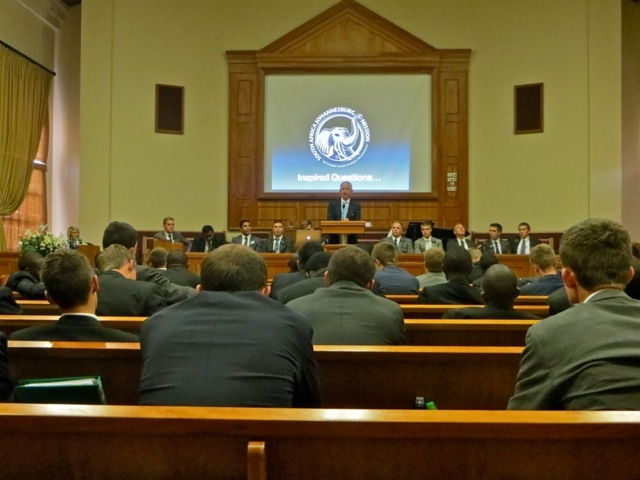 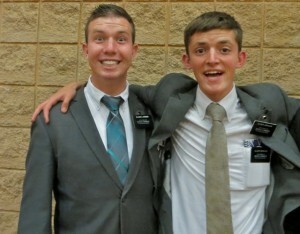 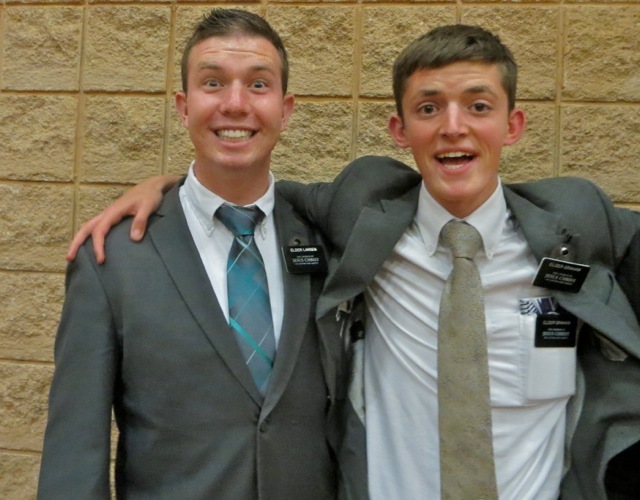 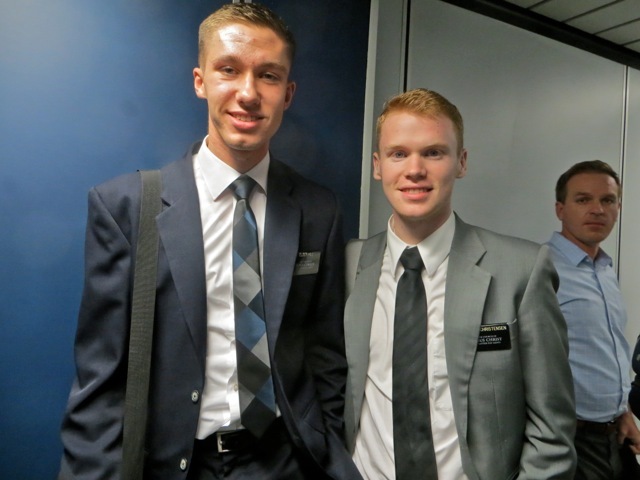 Anther Last for us…the last time we will meet with the YSA for FHE. 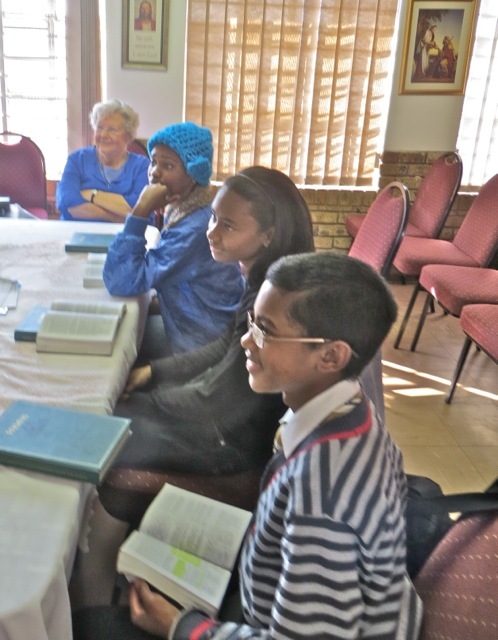 Tonight after an opening hymn…here being sung by sisters Kwaikwai – young and older and sister Ratema, there was opening prayer, a spiritual thought on Alma 37:35-37 and then a short but excellent lesson on keeping the Sabbath Day Holy by President Kwaiikwai. The it was time for some rousing games of Book of Mormon Bingo with lots of chocolate candy as prizes. 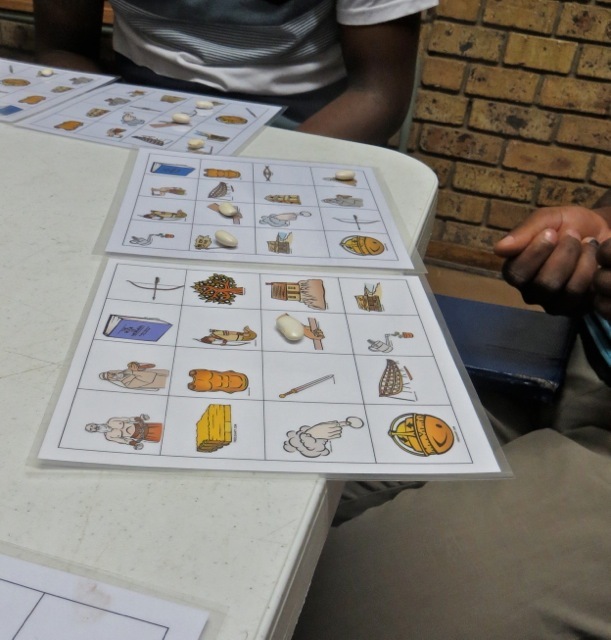 Everyone won some games except for president Kwaikwai who had these two cards that never gave him a bingo…he tried once to claim Bingo with three beans in a diagonal instead of the required four. We kept playing until he finally won. Everyone had a good laugh about that. After we had cleaned up the game there was refreshments. Pinenut to drink and full size Bar One candy bars for everyone – even president Kwaikwai got one of them! 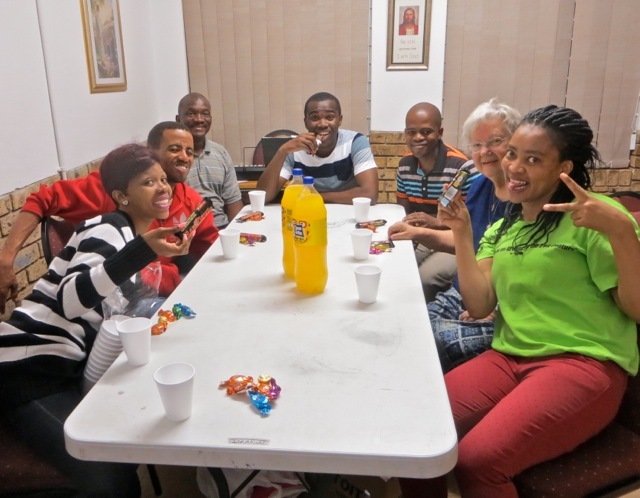 So it was a night of learning, fellowshipping, laughter, and fun. 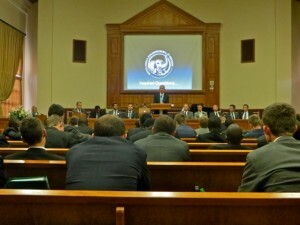 Too bad there were not more YSA here to share it with us. 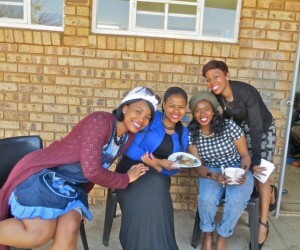 We wanted to take pictures with everyone. 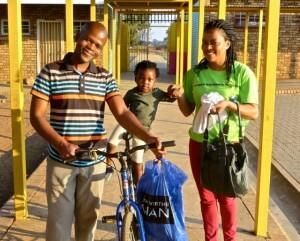 President Kwaikwai arrived on his bike which was taken over by their little one. 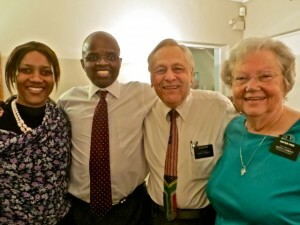 Before the meeting we got to have one with Gomolemo and David. 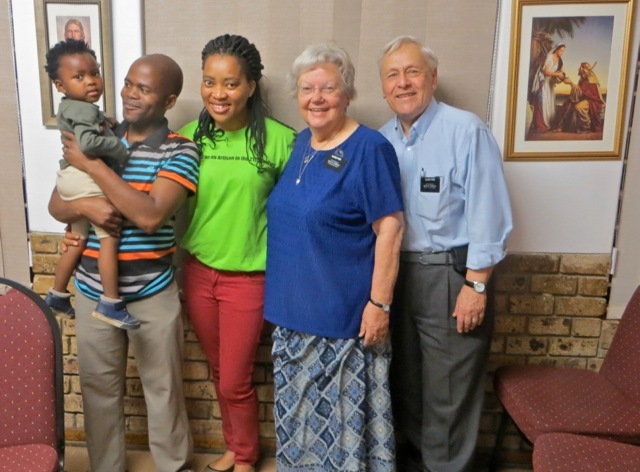 After the meeting we took one with sister Meisie Ratema, David Lebona, the Kwaikwai family and even one of just the two of us. 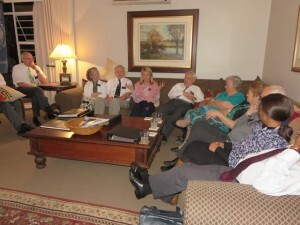 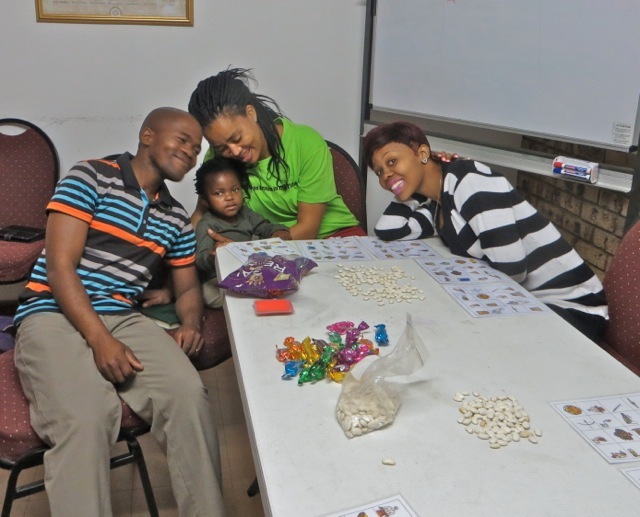 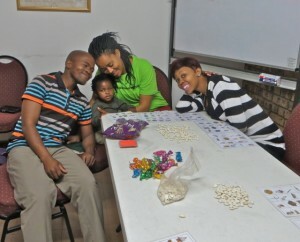 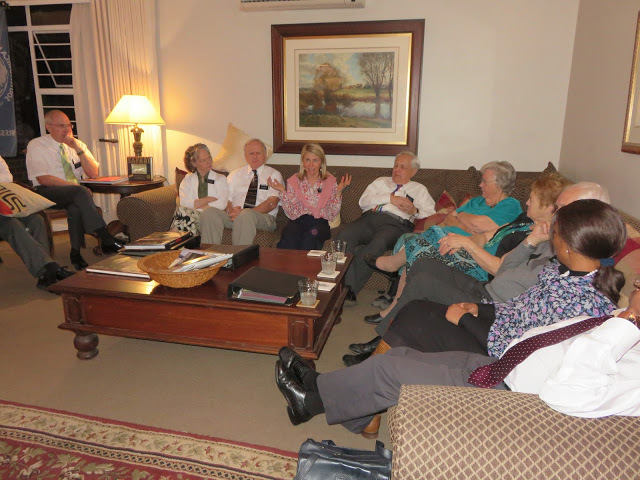 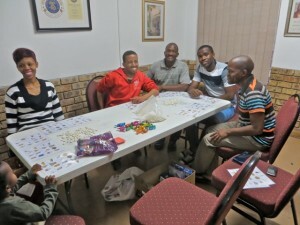 We shared our feeling of love for all of these great members of the Potchefstroom branch. 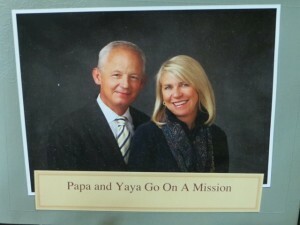 We are certainly going to miss them…FHE with the Empty Nesters will be fun but not quite as much fun as we have had here. 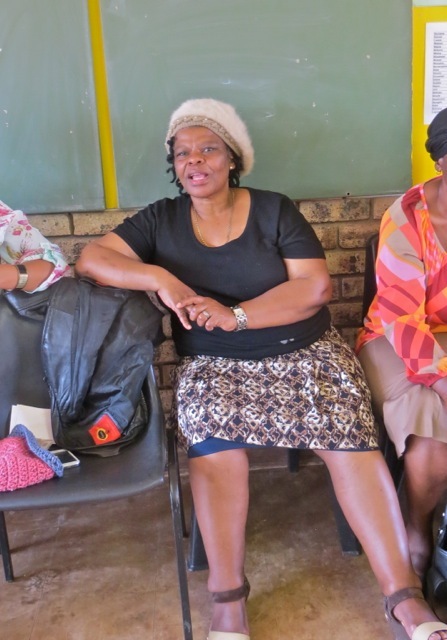 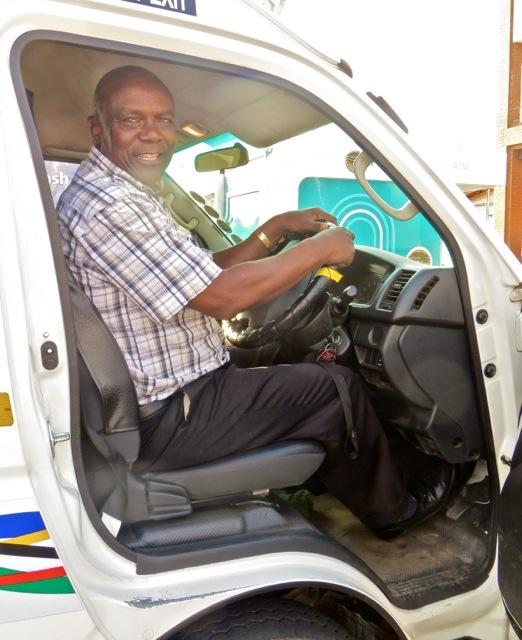 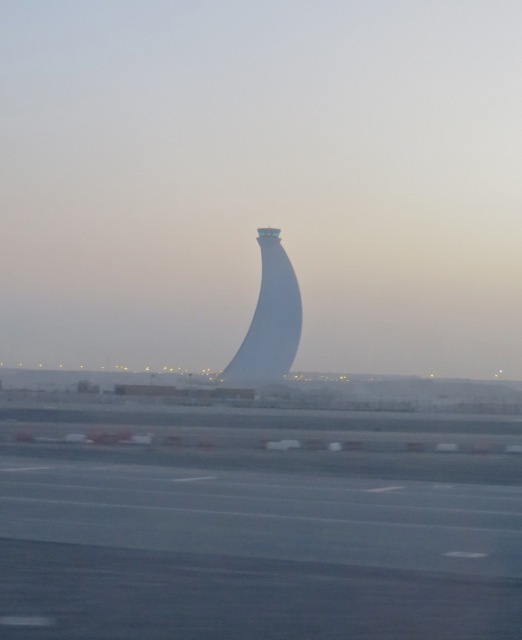 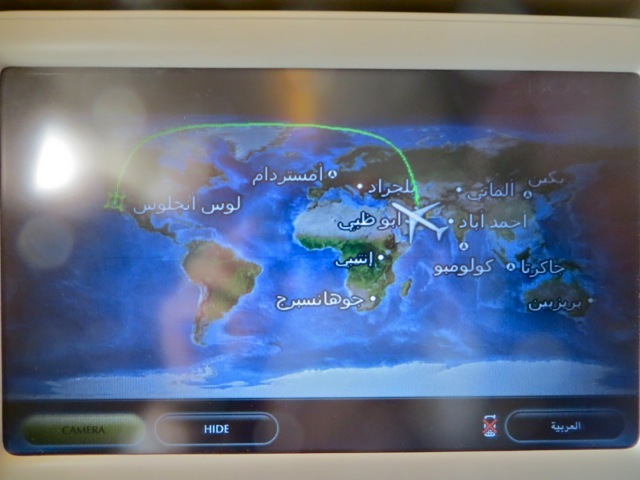 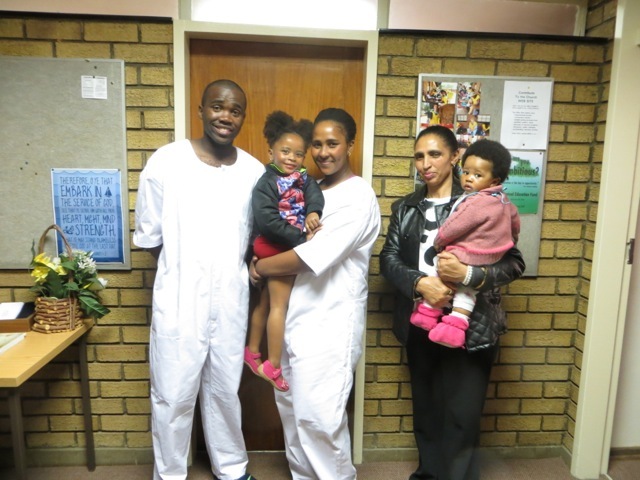 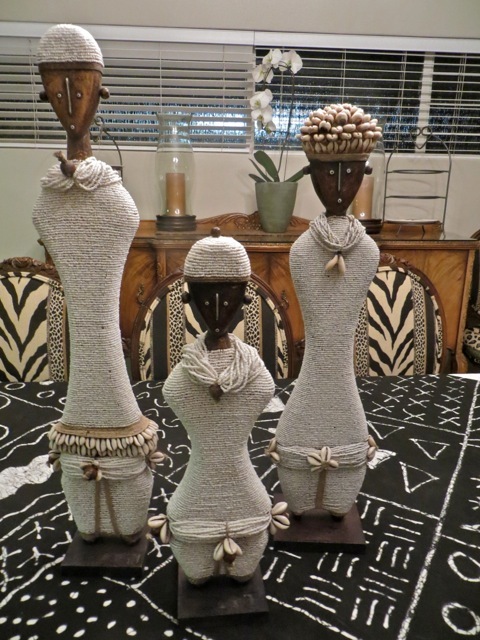 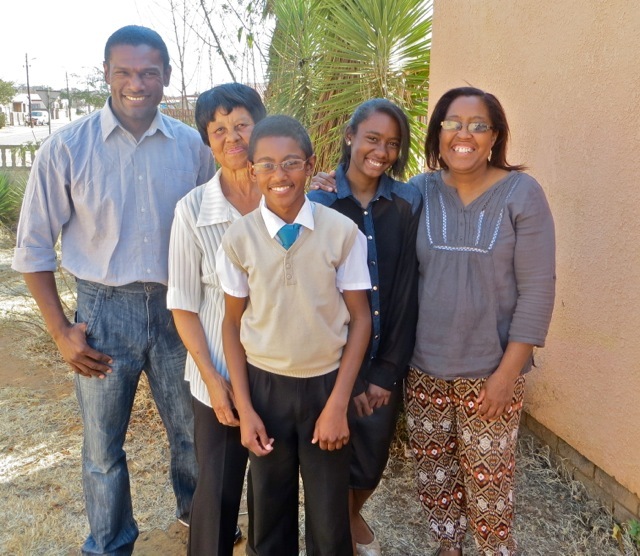 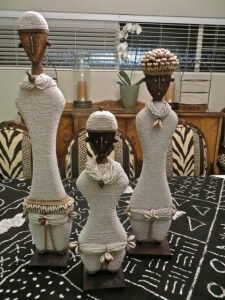 This entry was posted in Johannesburg Mission - Back To Africa on August 17, 2015 by Bill. 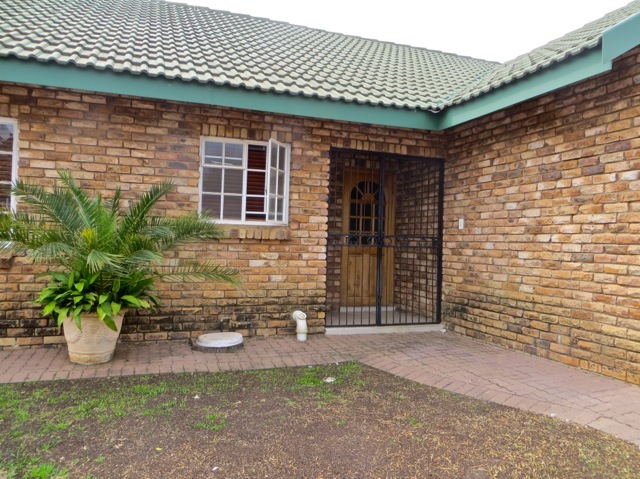 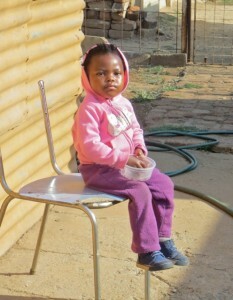 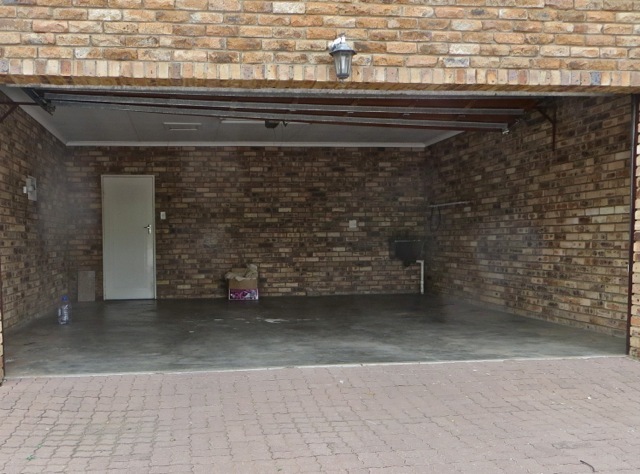 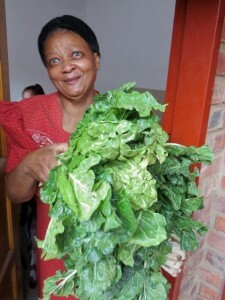 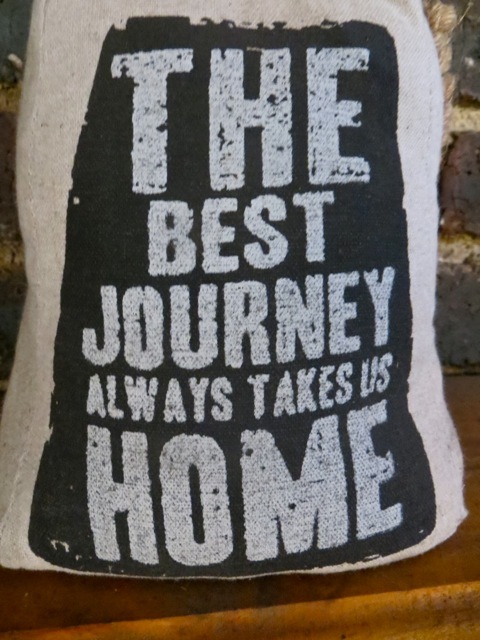 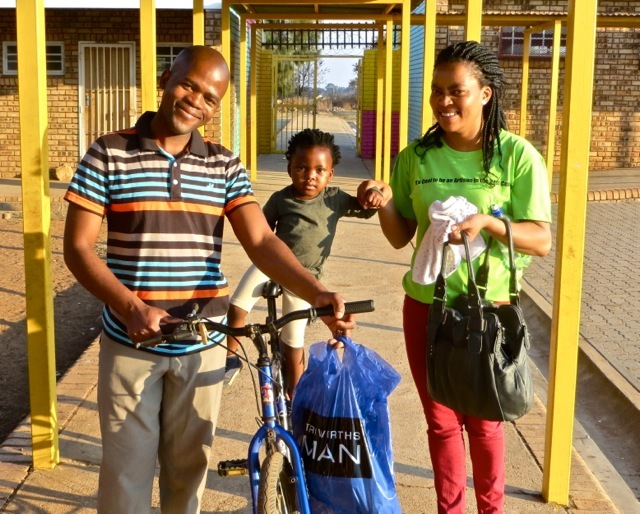 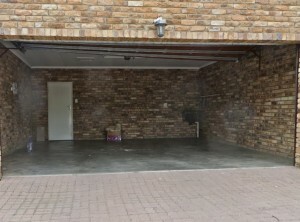 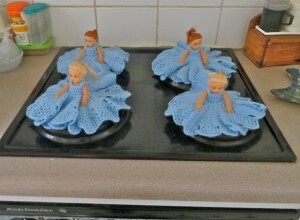 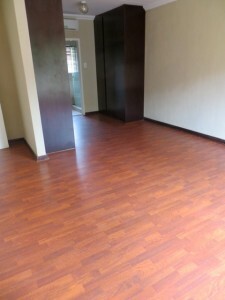 Just as it is starting to warm up for spring here in Potchefstroom we are starting to pack up to leave for home. 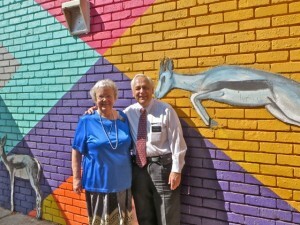 But today was one of those great, warm, sunny early spring Sabbaths that we remember from last year. 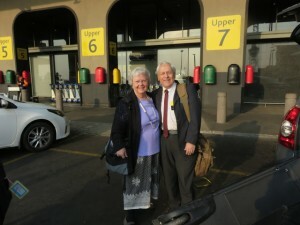 Since we will only have one more Sunday here is South Africa and because some asked me why I did not post more photos on Facebook lately, I took lots of pictures and here are most of them. 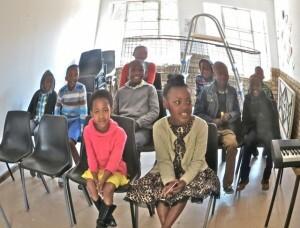 Some how I turned the selector to fisheye so here is the primary class a little out of focus. 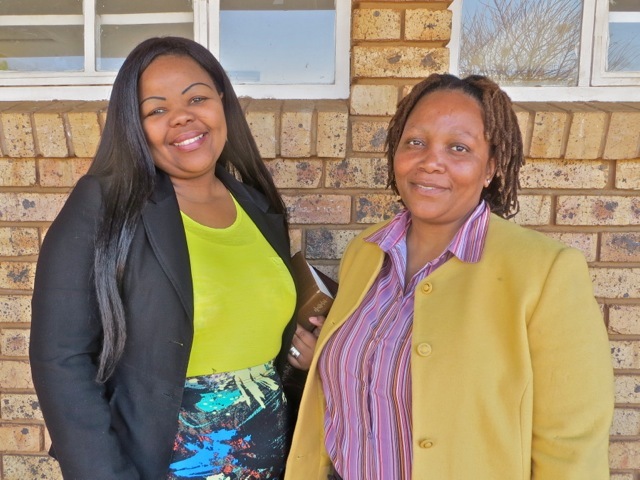 Sister Ncapayi and sister Kujane stopped for a photo. 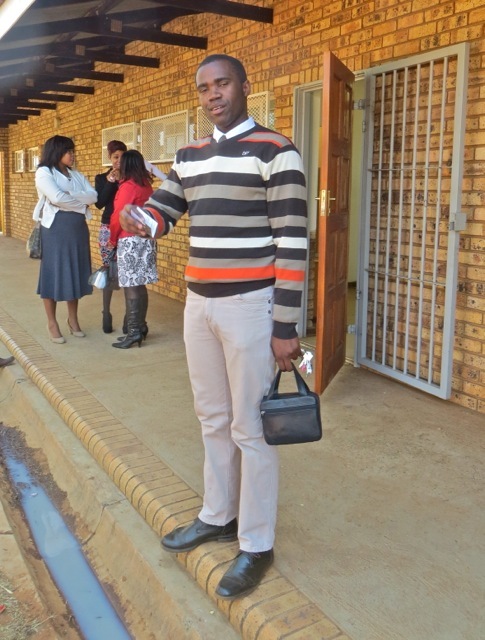 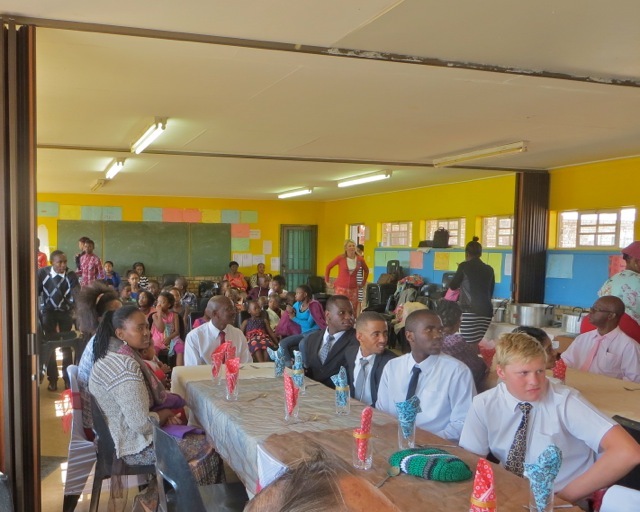 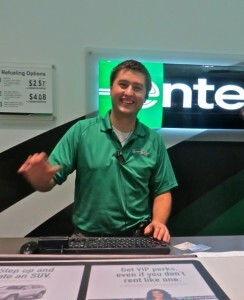 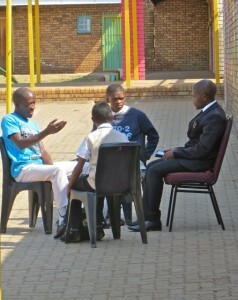 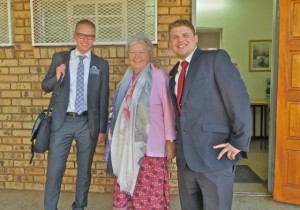 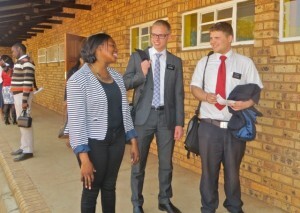 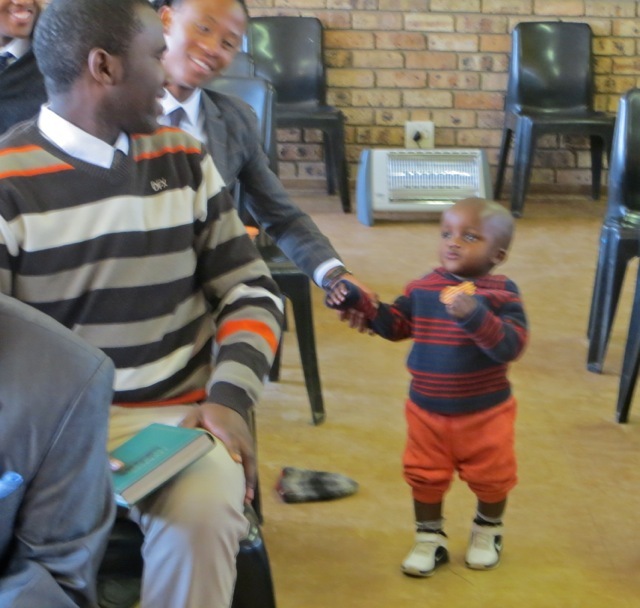 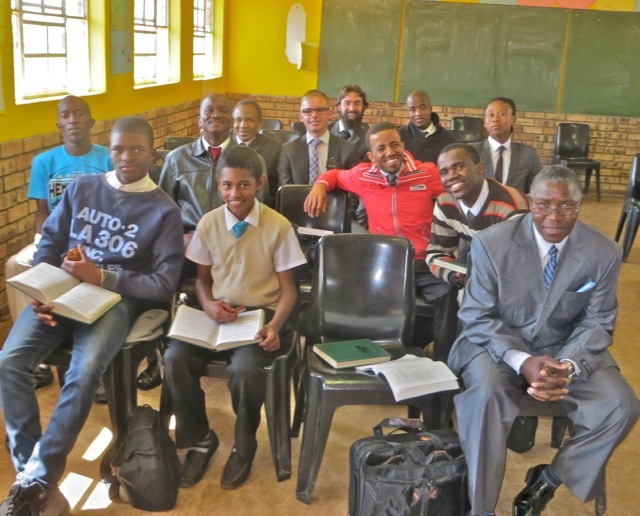 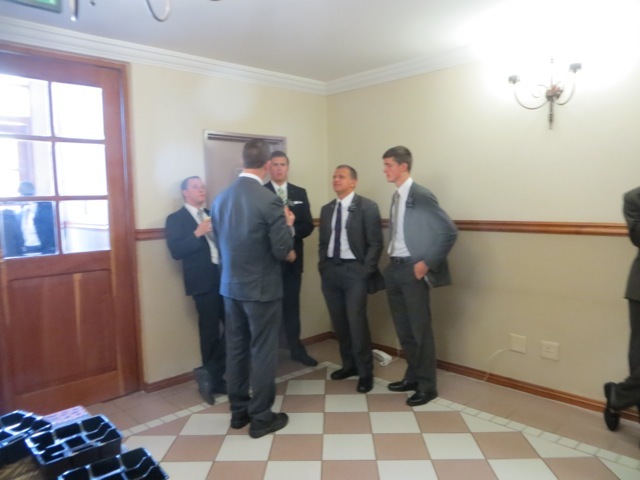 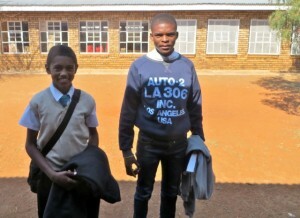 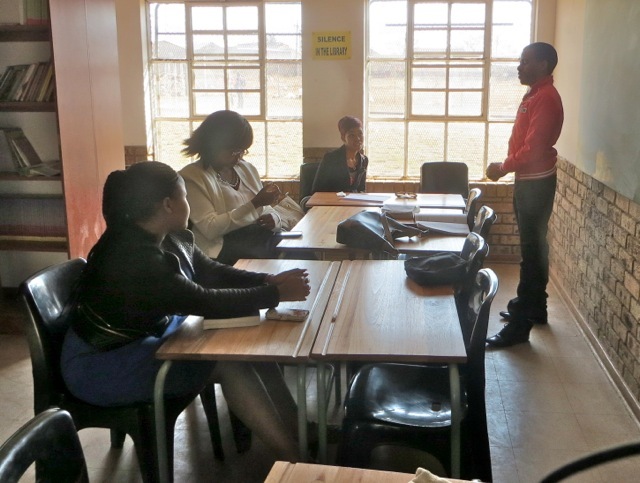 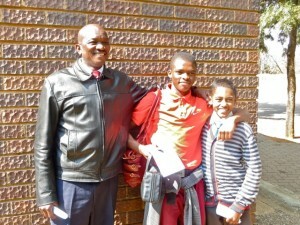 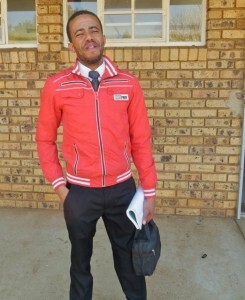 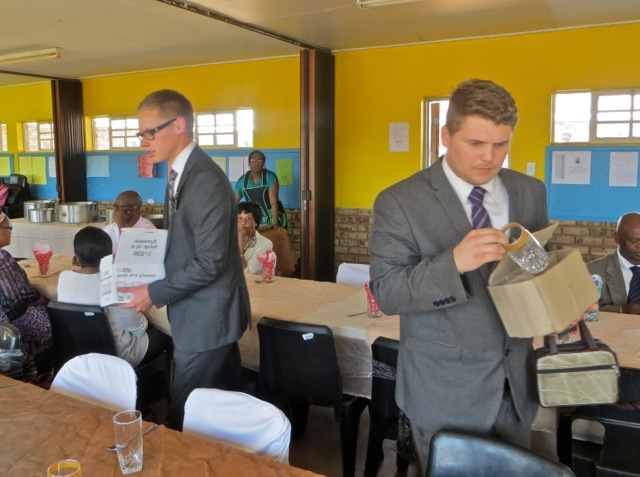 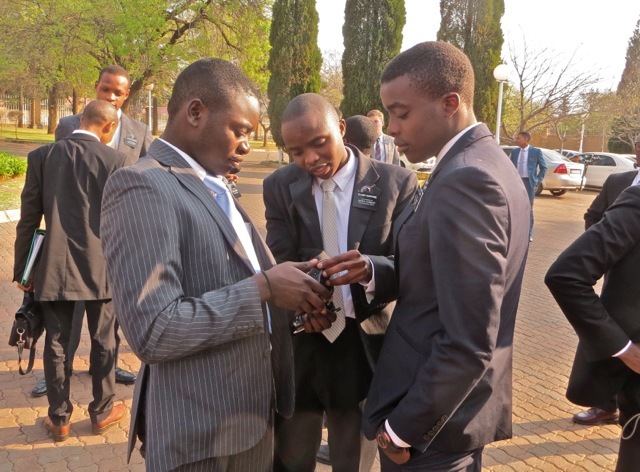 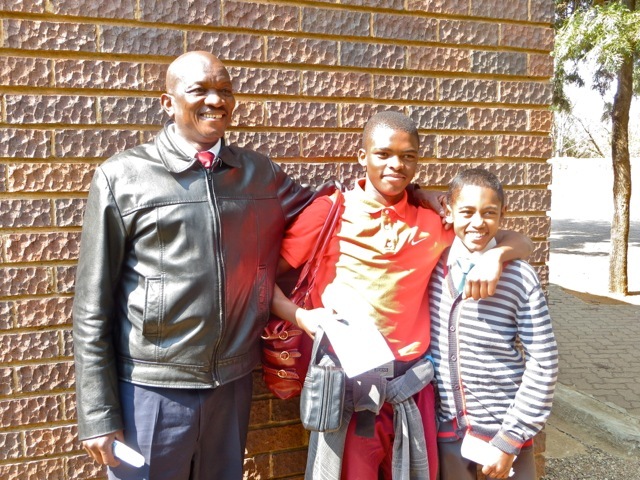 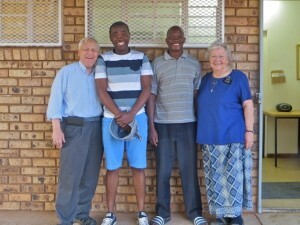 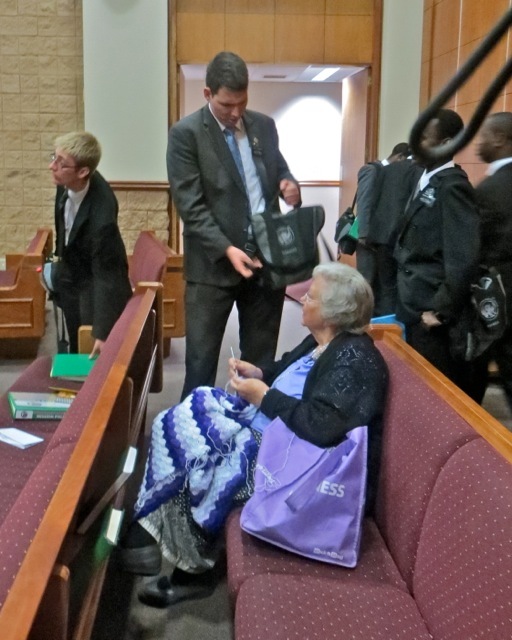 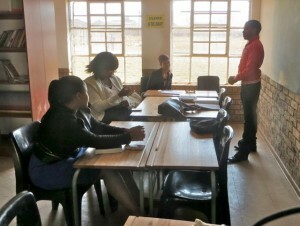 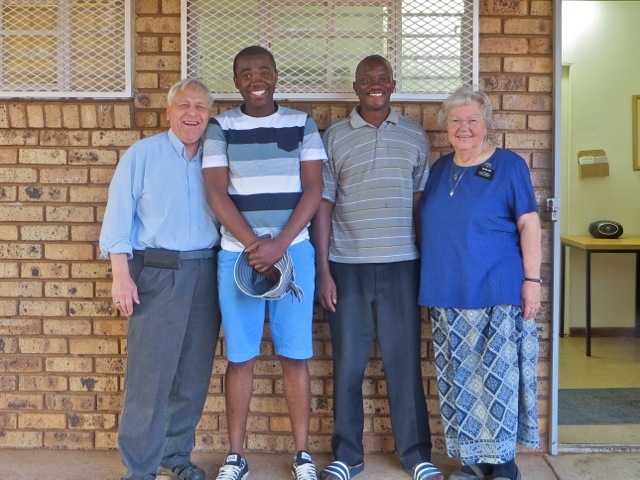 Elder Hentunen was busy making an appointment with a young man who is going to school here but is from Bloomfontein. 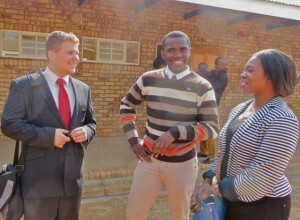 He could come because president Kwaikwai wrote a letter to his employer saying how important it was for him to have Sunday’s off and it worked. 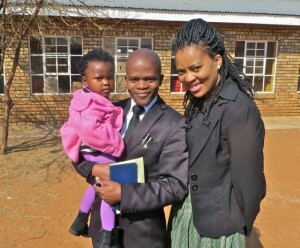 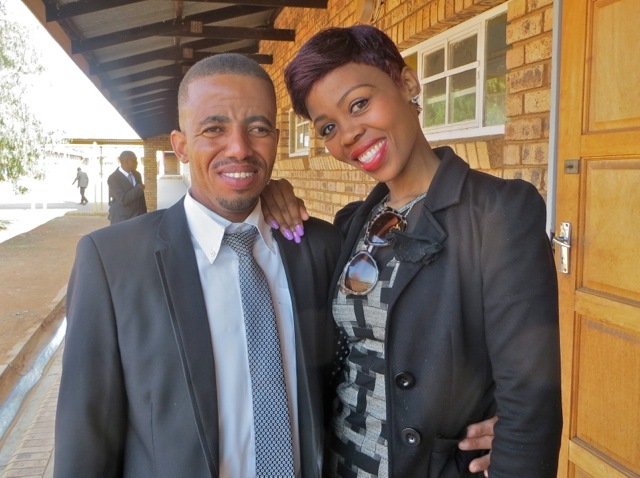 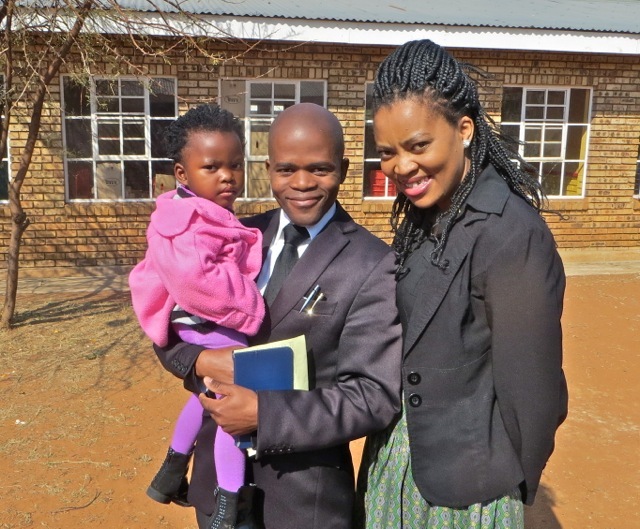 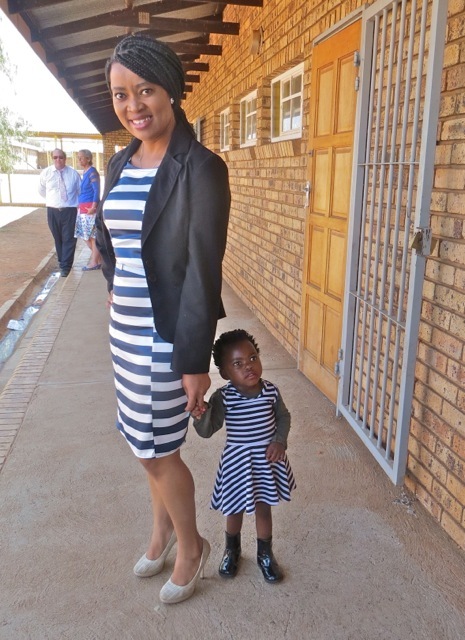 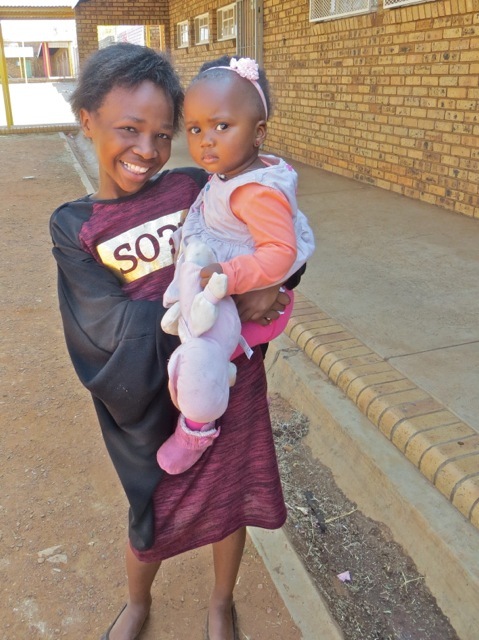 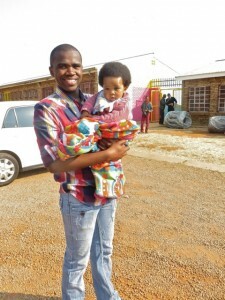 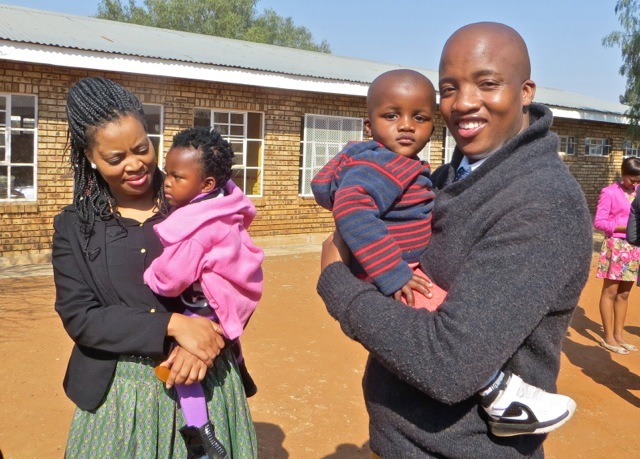 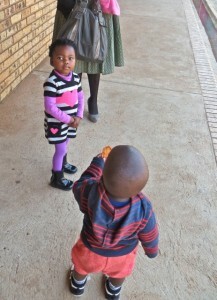 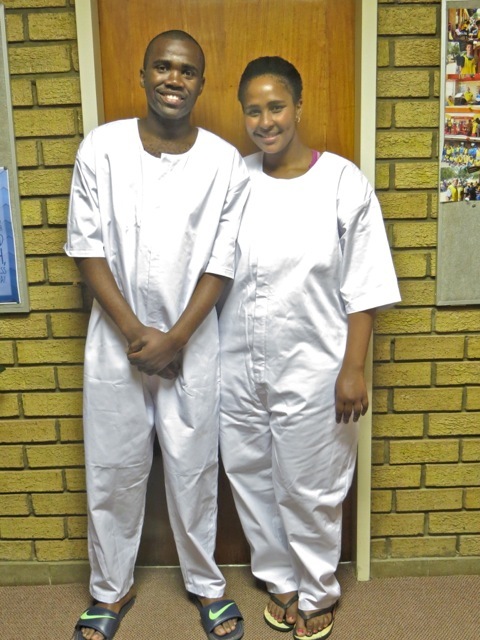 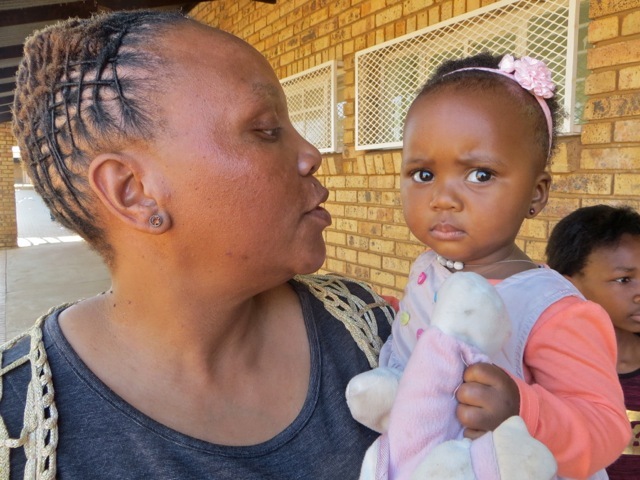 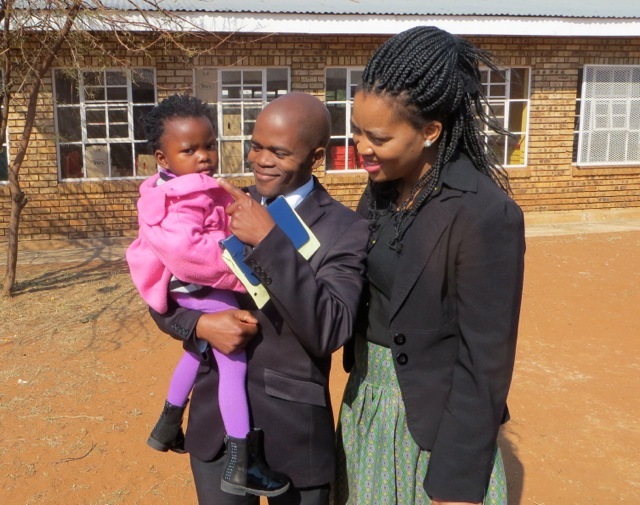 Sister Kwaikwai had her littlest one with her today as did brother Komatso. 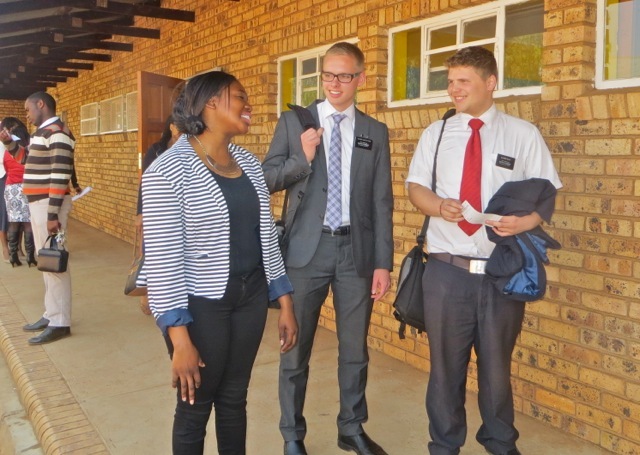 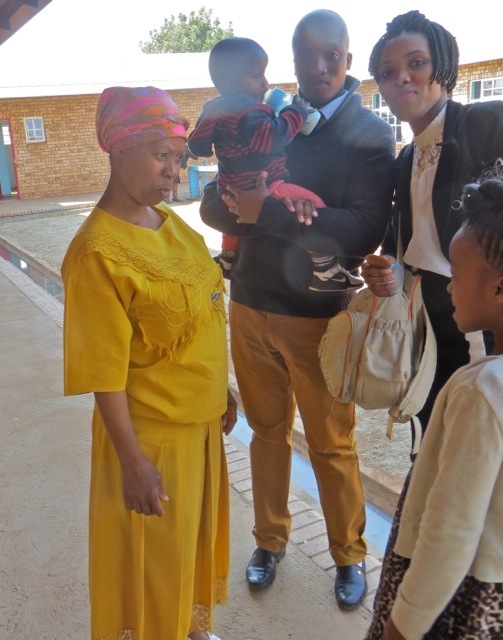 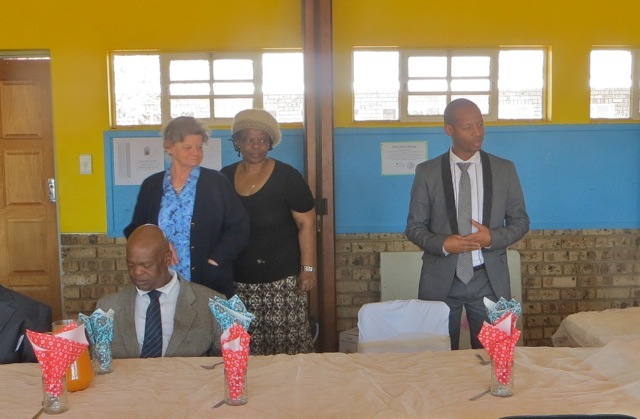 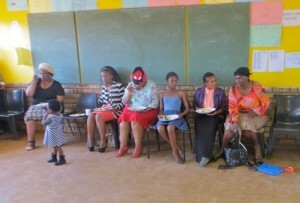 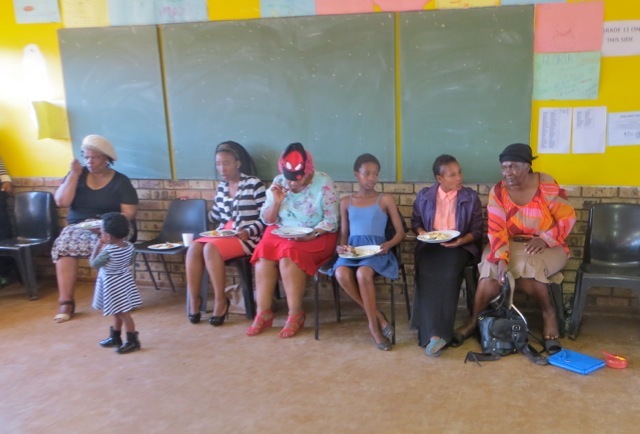 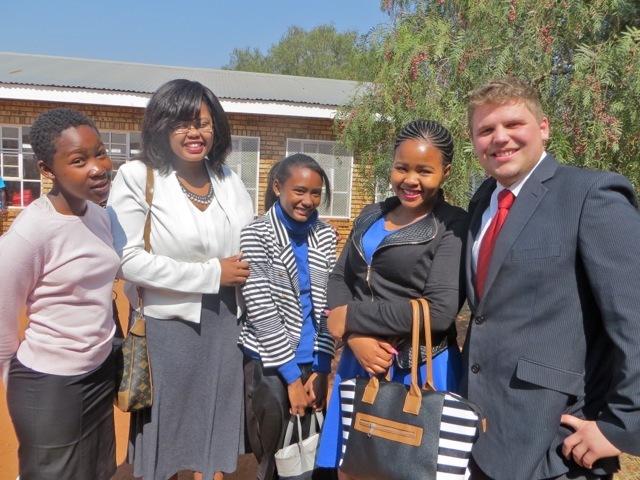 Elder Wild and brother Gomolemo talked to sister Nthabiseng in the sunshine while sister Merriam in the yellow dress talked Lydia Mokate. 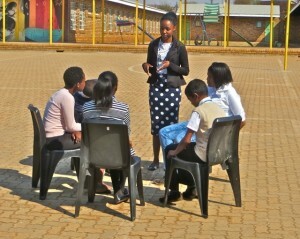 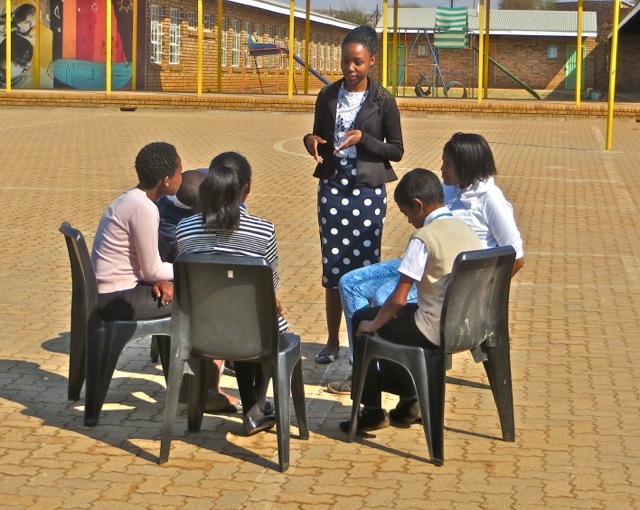 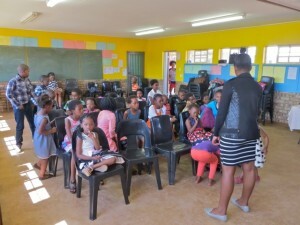 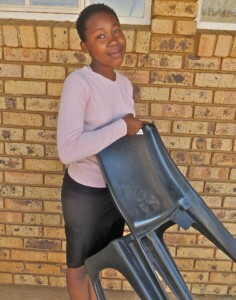 It was so nice outside that sister Thato Kujane moved her Sunday School class out into the playground. 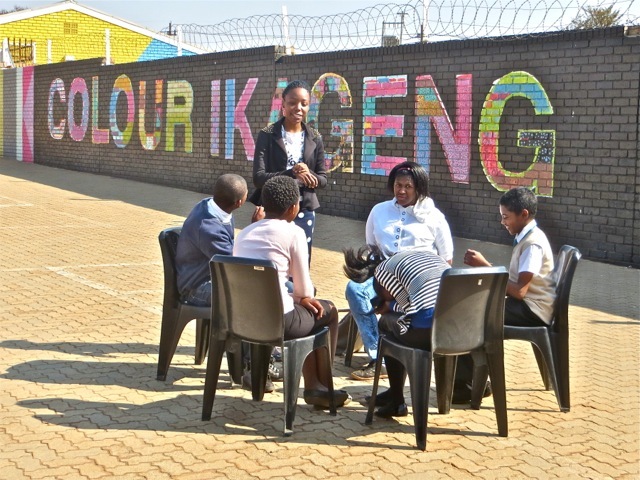 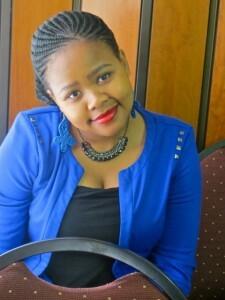 I was lucky to catch the Colour Ikageng sign as a backdrop. Notice the ‘u’ in color…British you know! 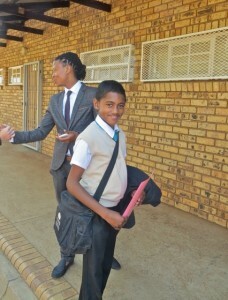 In Primary boys will be boys when a camera is aimed their way. 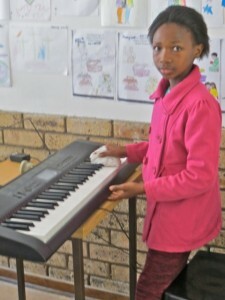 Sister Lerato Kujane is cleaning the keyboard which she is learning to play. Adam Lebona taught the small YSA class while Dolly Ratema is taking her chair back to the class room after a warm lesson in the sun. I am not sure what Adam was thinking about when I took his photo…he seems to be meditating. 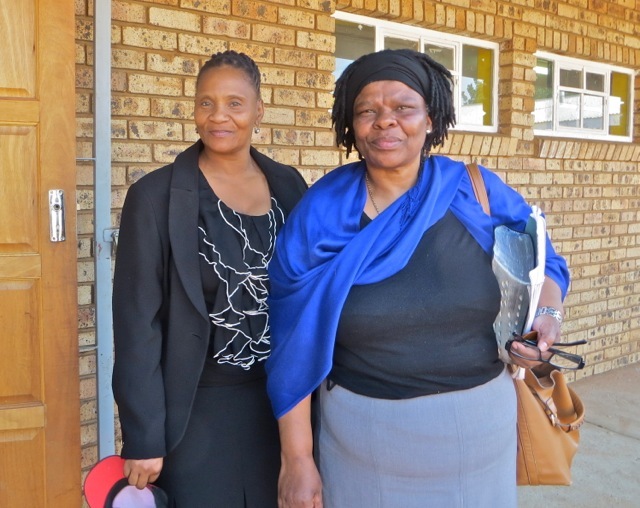 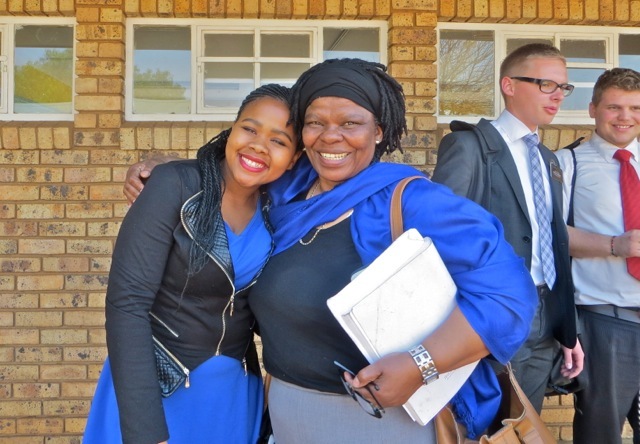 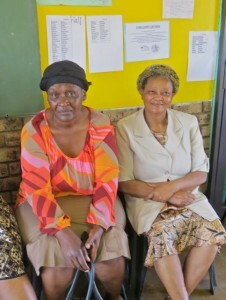 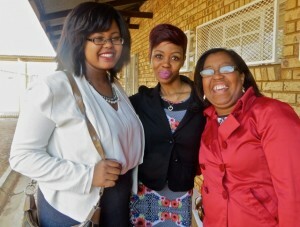 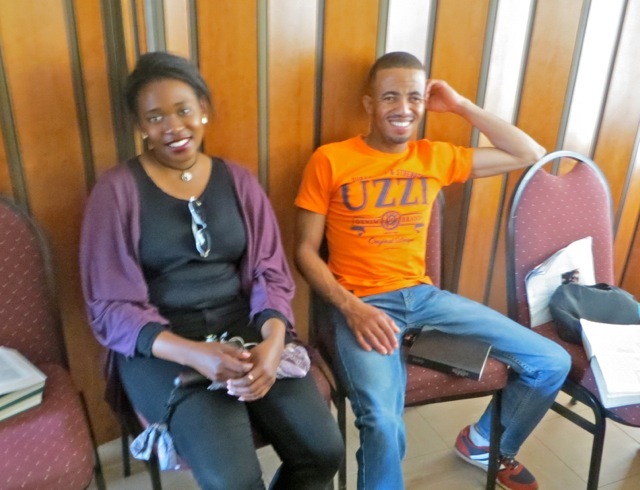 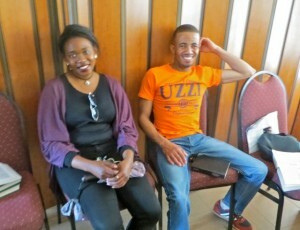 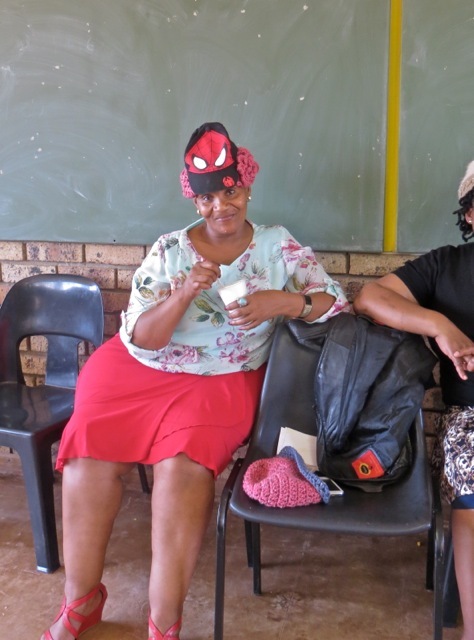 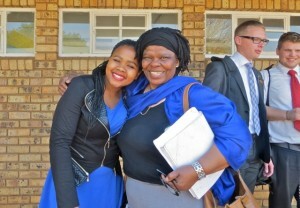 Sisters Thulo and Williams did not give me a smile in this photo but made up for it in others. 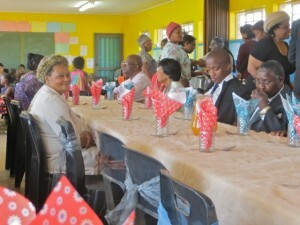 Nthabiseng talks to the elders and Sisters Kea and Williams give me a big smile with the elders in the background. 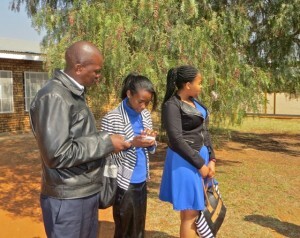 Brother Gomolemo gets his picture snapped while in the background sisters Neo, Ratema, and Kruger are talking. 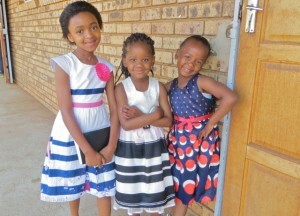 Their turn was next. 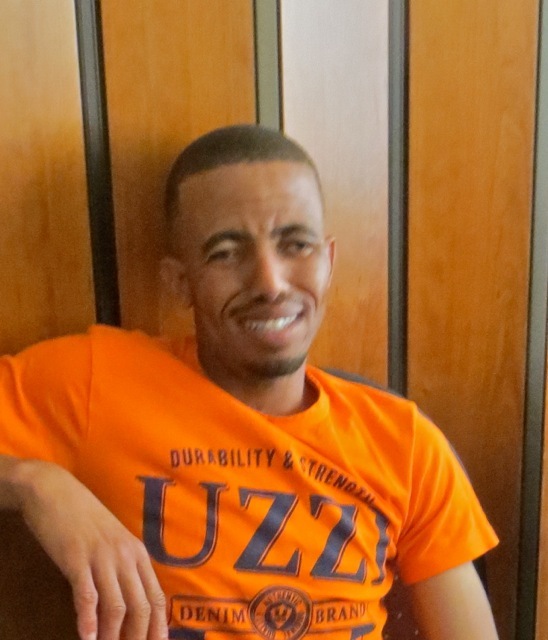 Jacque Kruger smiles while an investigator is wearing an Los Angeles USA sweatshirt – that is our original home town. Sister Antoinette has a great smile and so does sister Ratema. The young man seems more interested in his chip than the beautiful young lady in front of him. 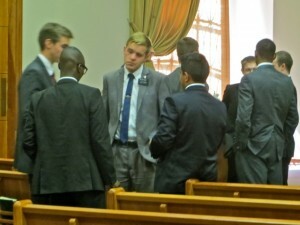 I wanted one photo of the the Priesthood today and so here they are. 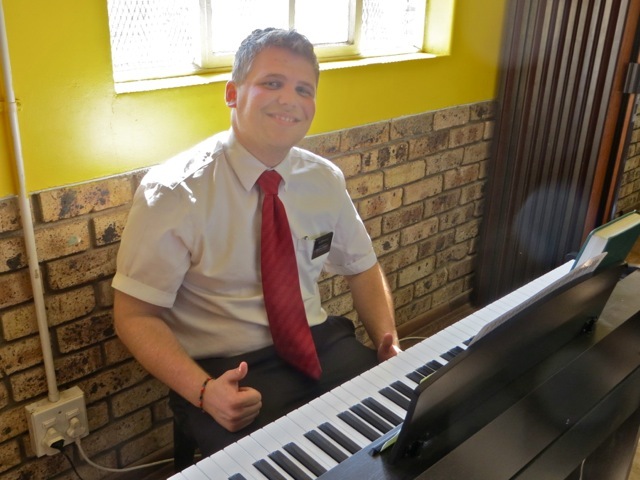 Elder Wild is the designated keyboard player for PH…that is he starts the selected song when he is supposed to…the keyboard does the rest. 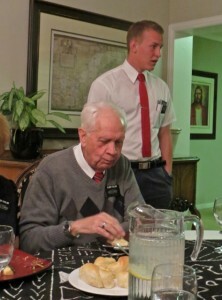 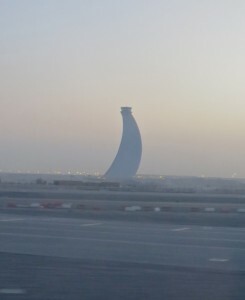 The young man seems to have another chip – if it keeps him happy and quiet I am not going to complain. 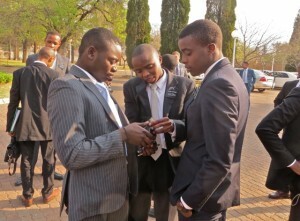 President Kwaikwai thought sister Kujane’s idea was so good that he moved his Aaronic PH class outside. 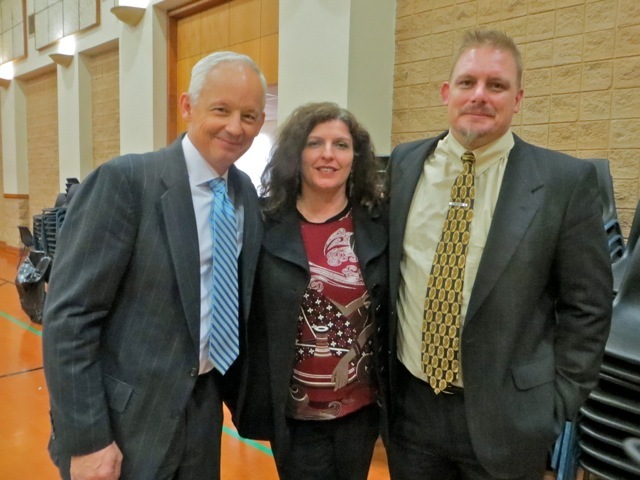 We wanted a photo with us and brother Sidney Robbins…hopefully we will get one with him and his wife next week. She had to work this one. Sisters Dolly, Neo, Shavonne, and Kea were joined by elder Wild. 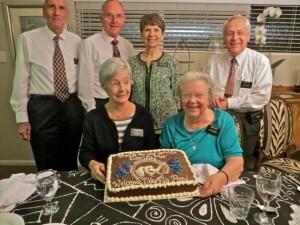 There is that great Jacque smile again. 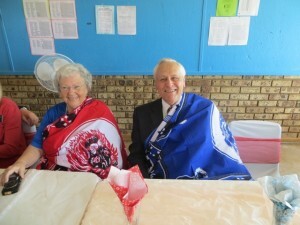 The elders with Mary and her new scarf. 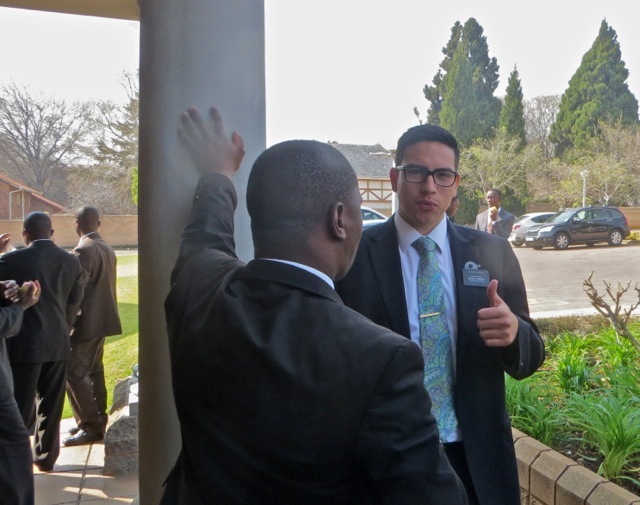 Brother David Rampai seems to be checking phone numbers with Shavonne Kruger while sister Kea’s attention is somewhere else. 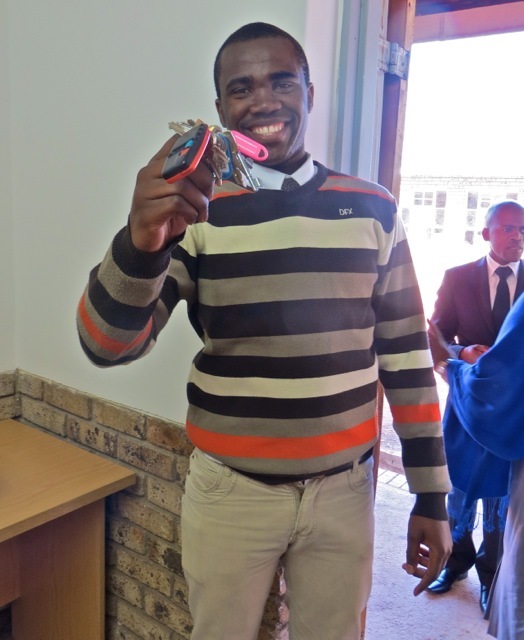 Brother Gomolemo shows off the keys that he thought he had left in the chapel which was now locked up but I had moved them before locking everything up. 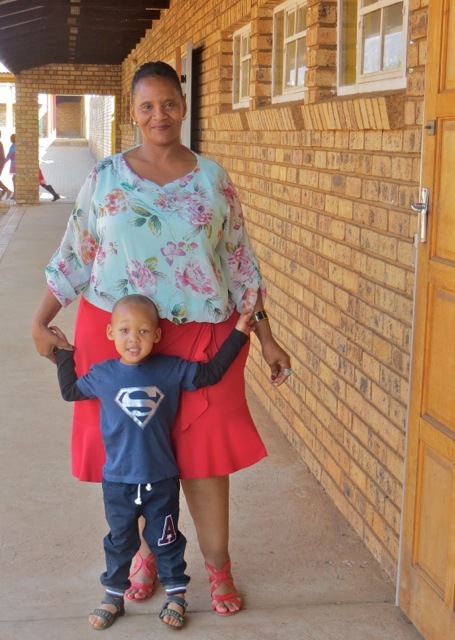 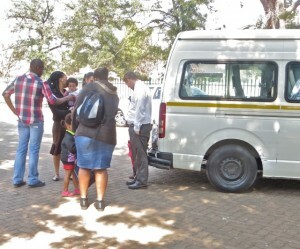 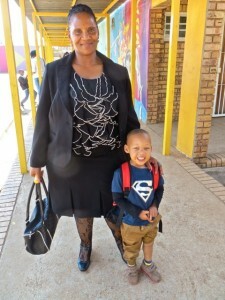 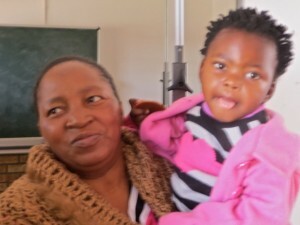 Sister Thulo and her grandson on the way out to the parking lot. 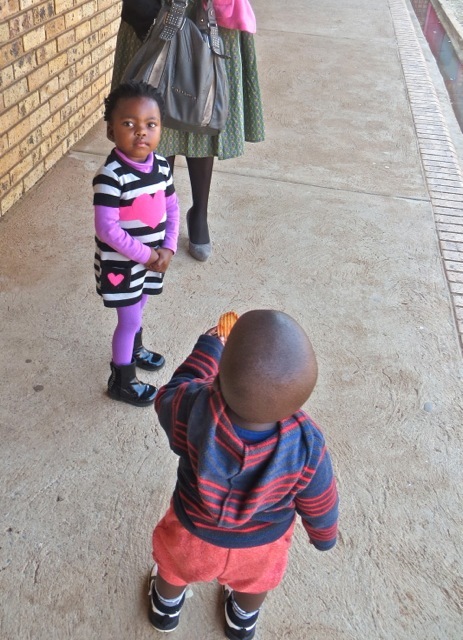 She still did not give me a big smile but he did. 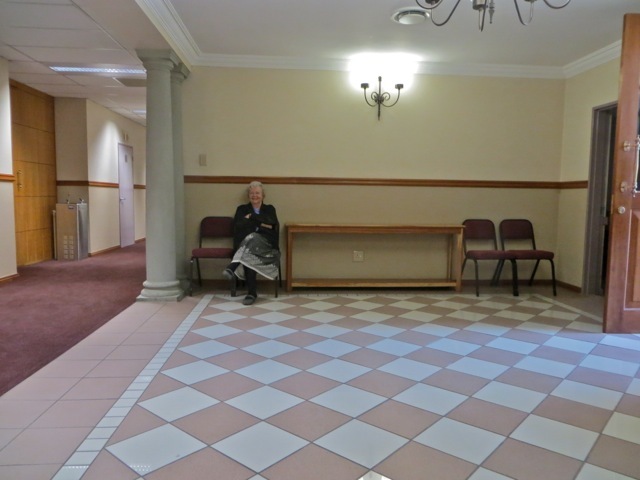 Sister Brummer really, really does not like me to take her picture but I told her I really need a good one before we left. 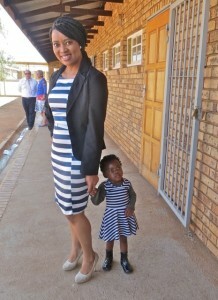 She had me promise it would be the last one…I had my fingers crossed when I said yes! 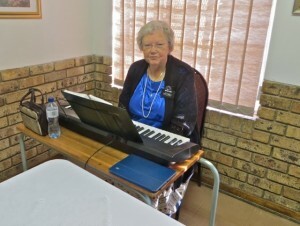 We drove the Krugers home so Mary could give Jacque a piano lesson. 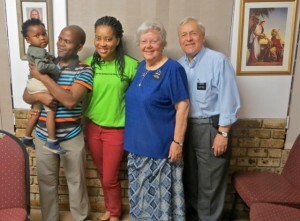 I wanted a family photo and then brother Kruger took a picture with us and the rest of the family. It was a really good day for taking lots of pictures. 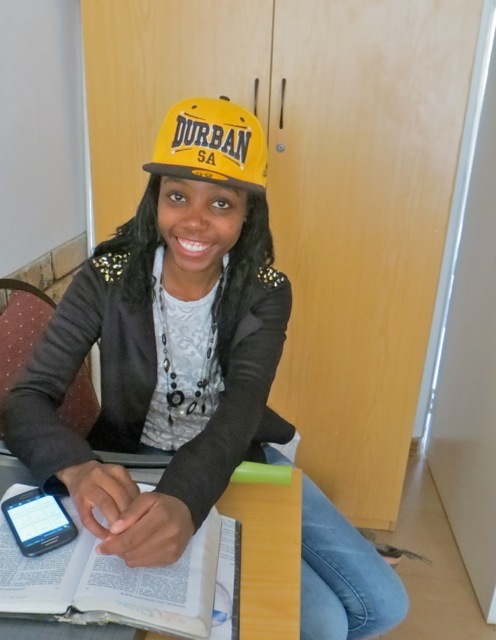 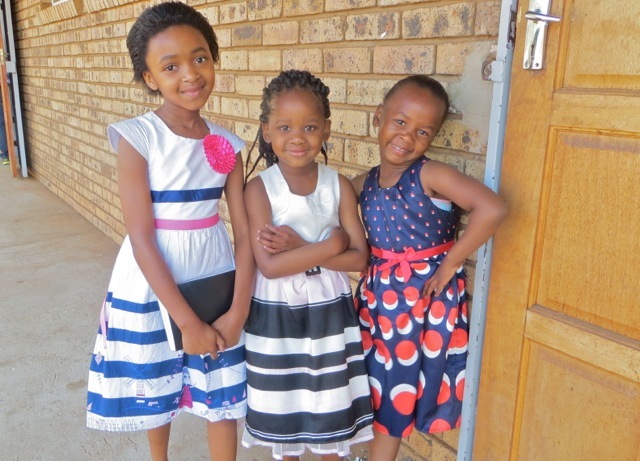 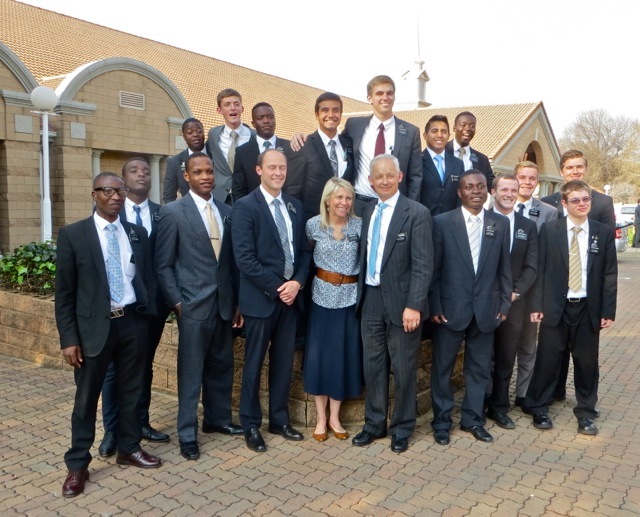 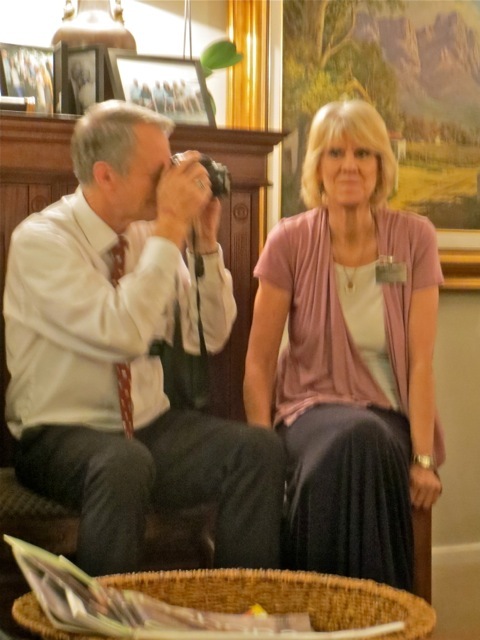 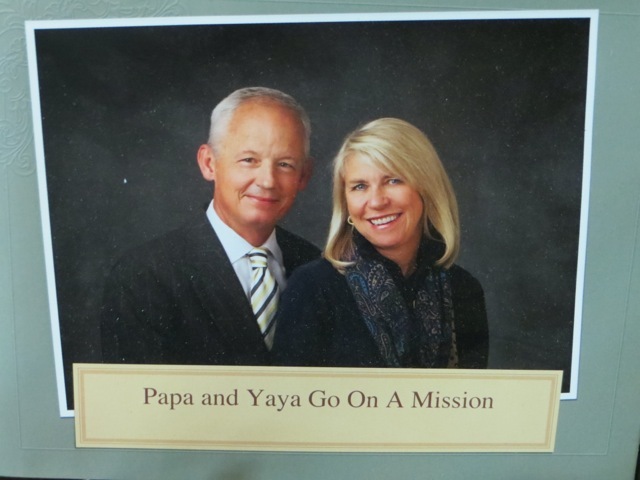 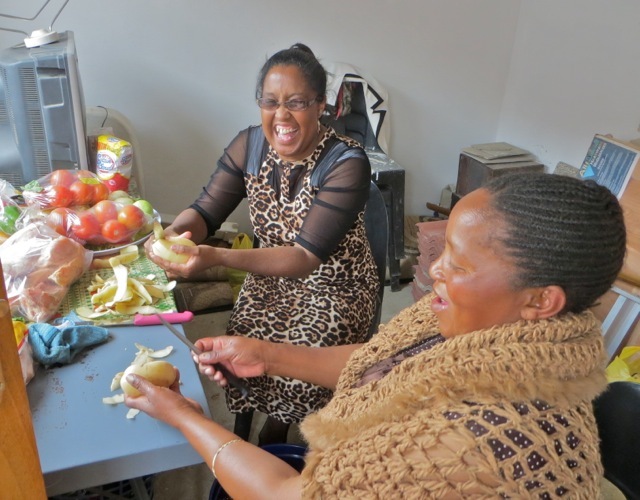 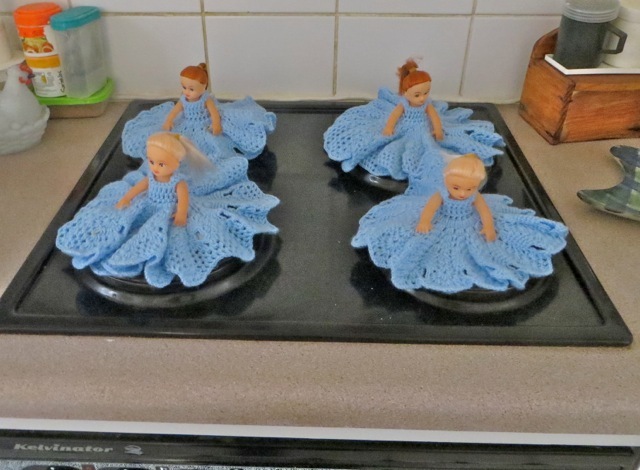 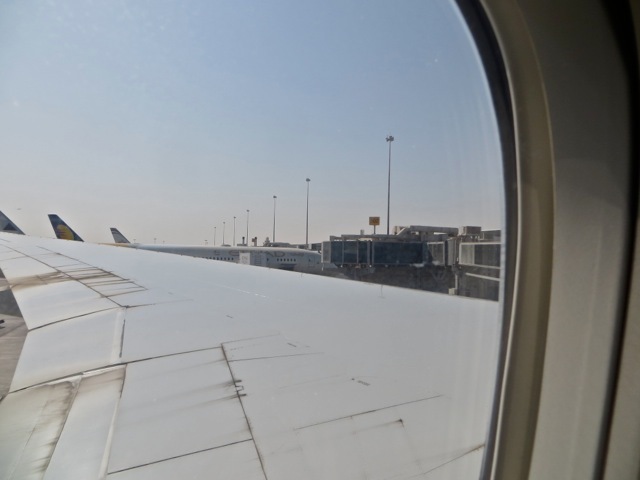 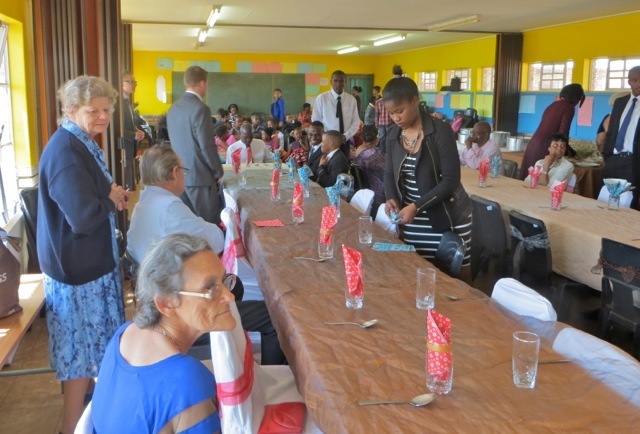 This entry was posted in Johannesburg Mission - Back To Africa on August 16, 2015 by Bill. 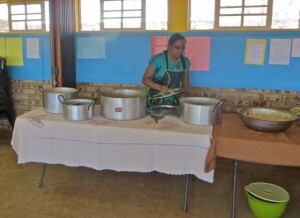 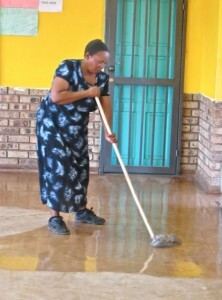 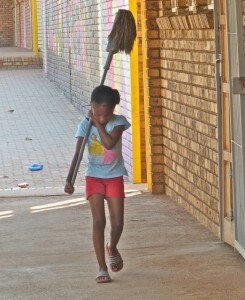 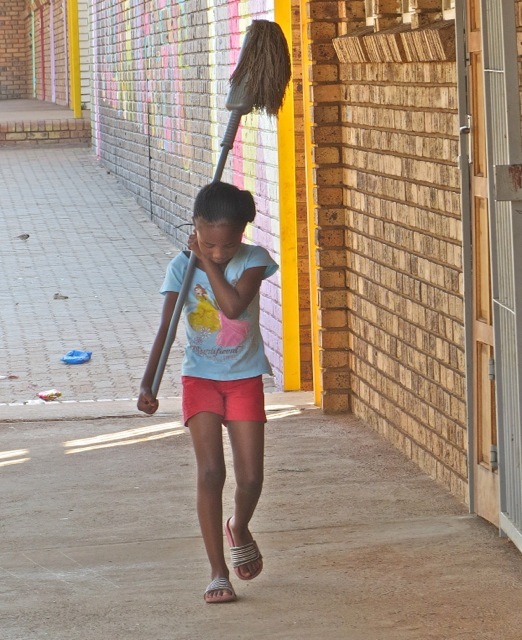 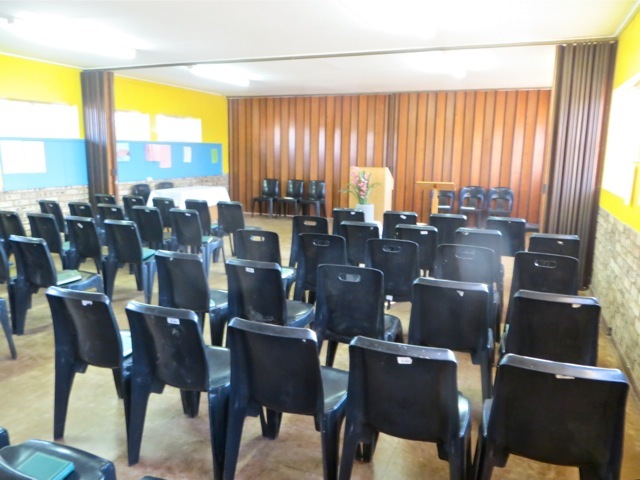 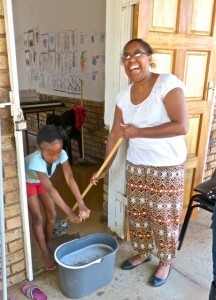 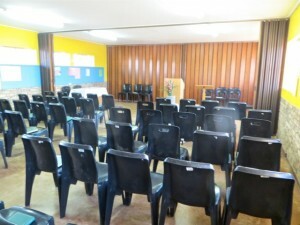 A Busy Saturday at the Potch Branch…Seminary, Institute and Chapel Cleaning! It was a busy Saturday afternoon at the chapel. 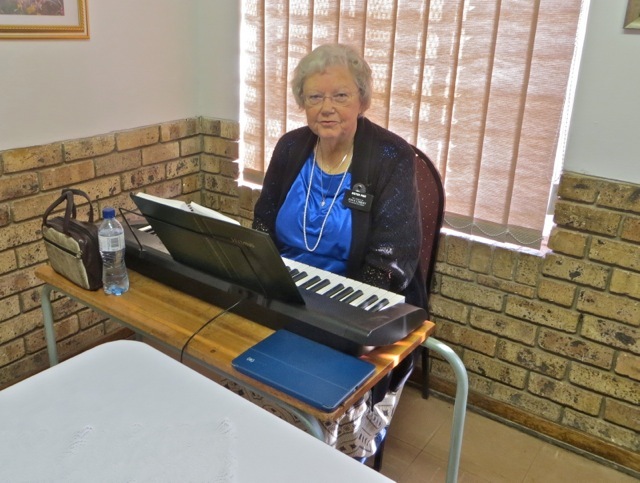 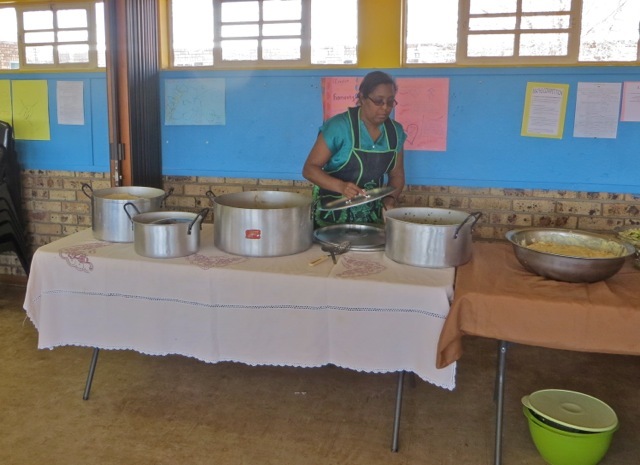 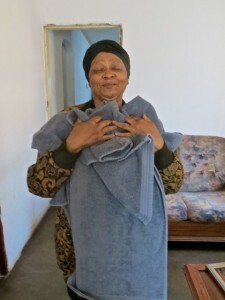 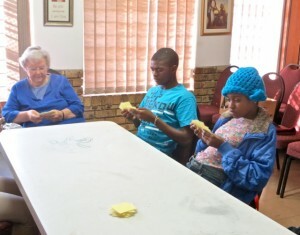 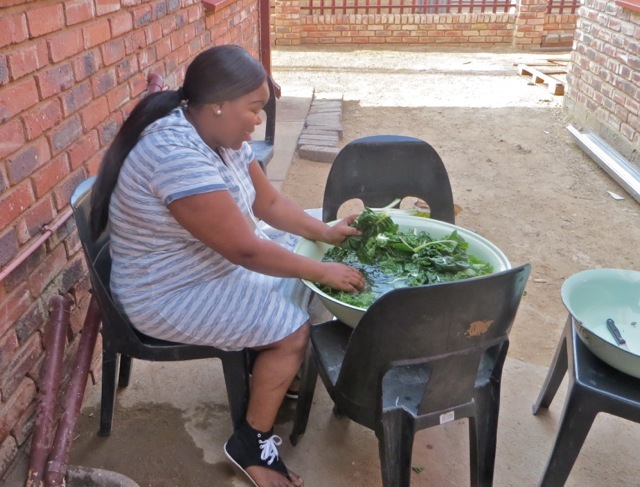 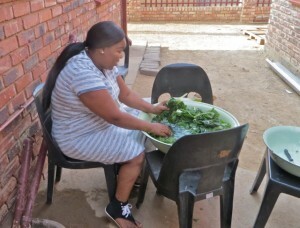 When we arrived there for Mary to sit in on Seminary, sisters Viona Kruger and Georgina Mogapi were busy washing and waxing the floors. They were aided by the young Kujane children, as well as a couple of the PH brethren. The seminary lesson was taught by Nasi Williams who did a great job. 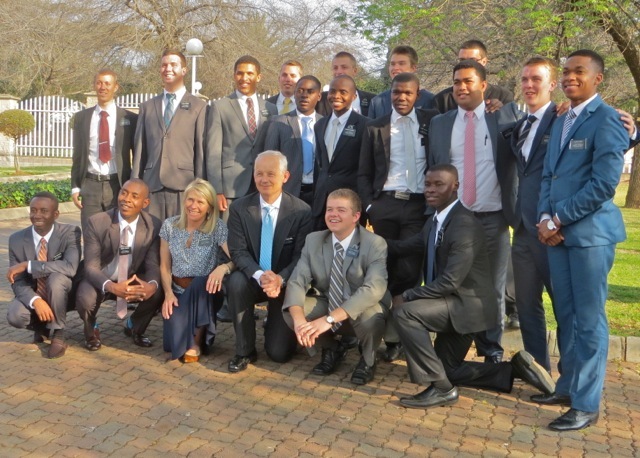 It has been wonderful to see how well the young men and women prepare to teach. 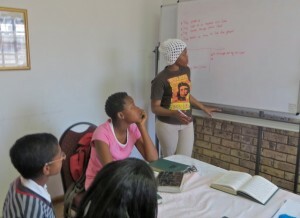 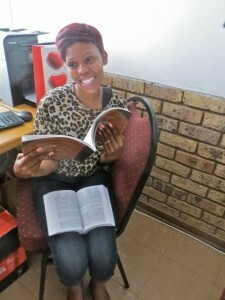 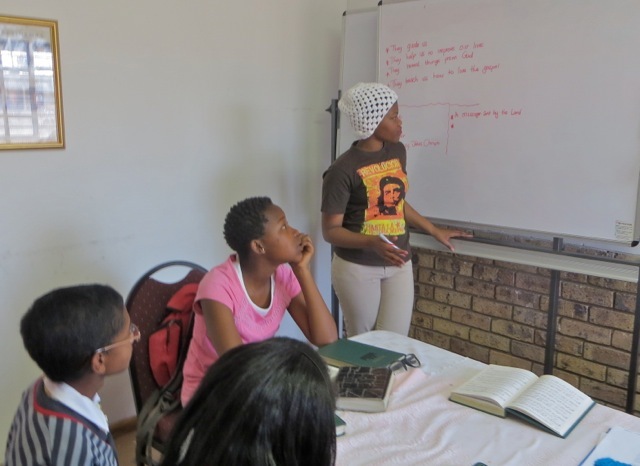 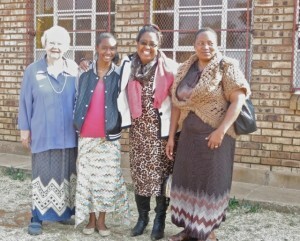 Mary was really inspired to start this program in Seminary as they will soon be ready to teach any class. 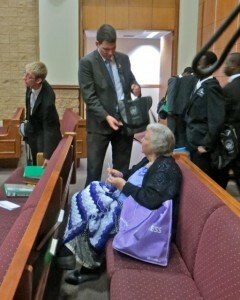 After the lesson they played Book of Mormon “Go Fish,” another legacy that we leave behind when we head home. 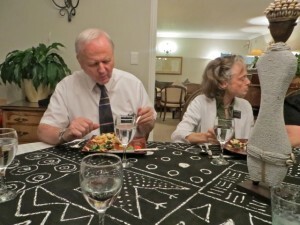 Mary created this and ‘Book of Mormon Bingo” that everyone seems to love to play. 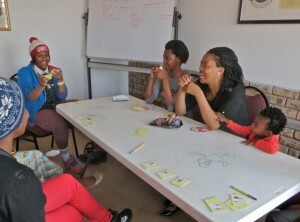 Go Fish gets some very serious playing but also lots of smiles and laughs. 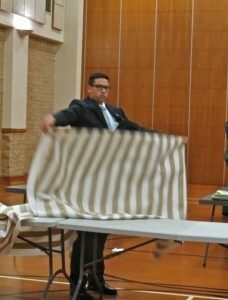 While this was going on the chapel got set up for tomorrow’s meeting. 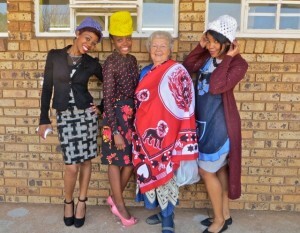 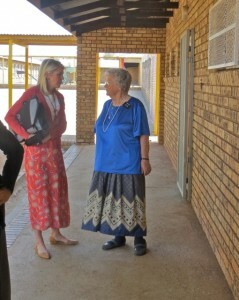 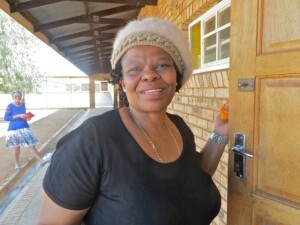 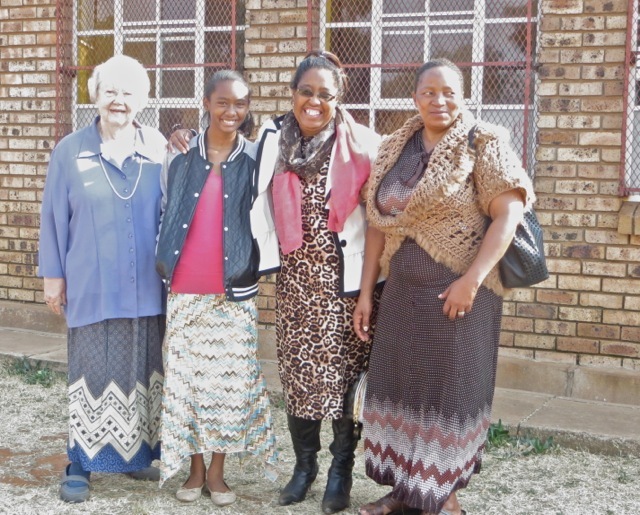 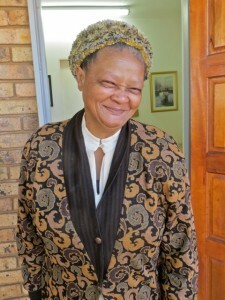 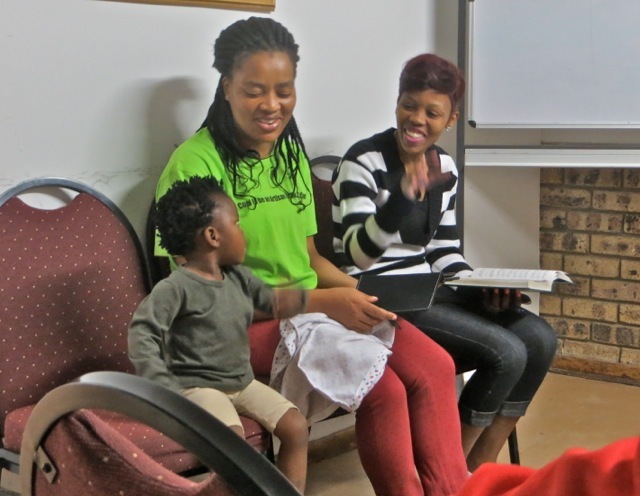 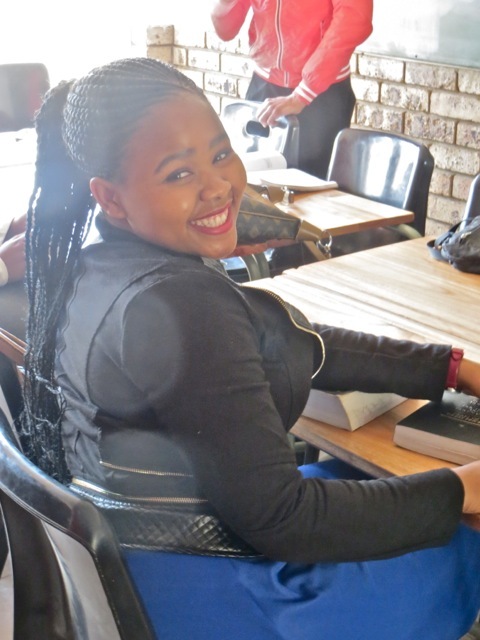 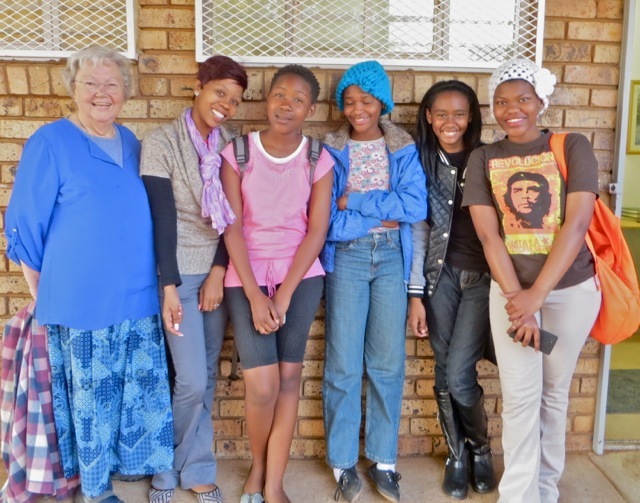 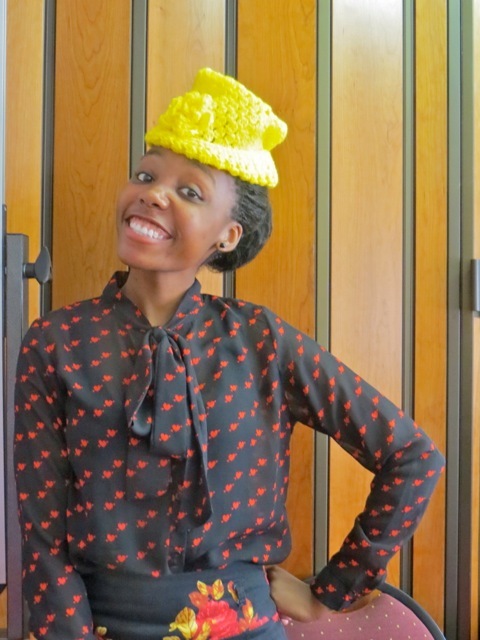 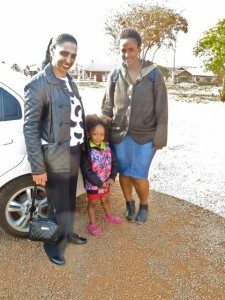 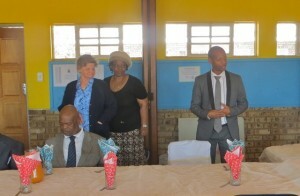 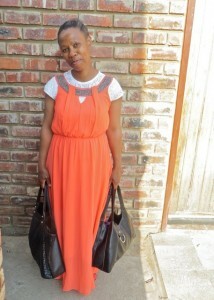 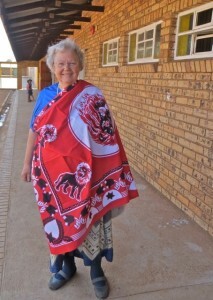 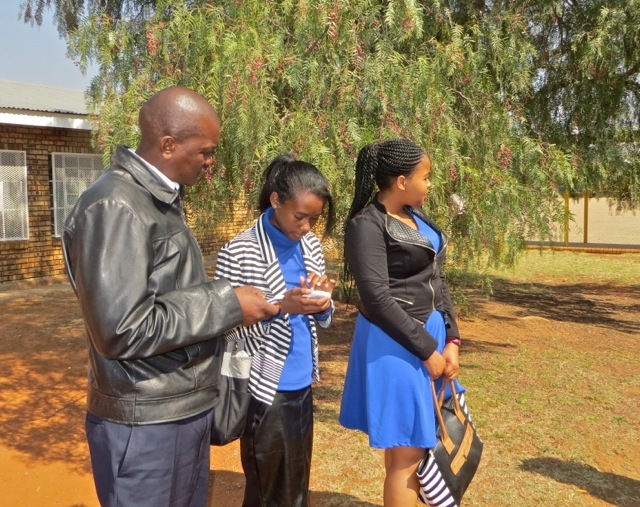 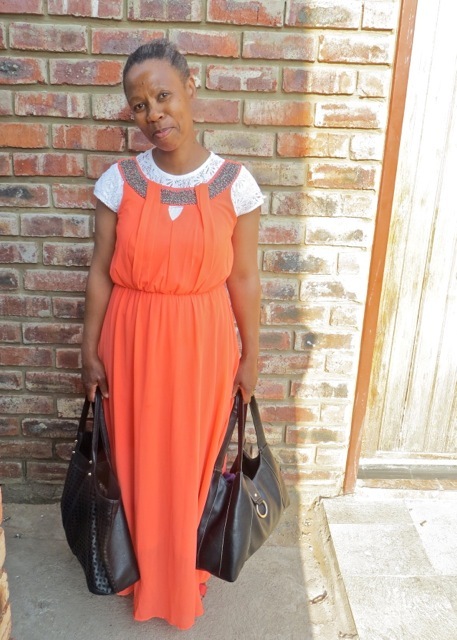 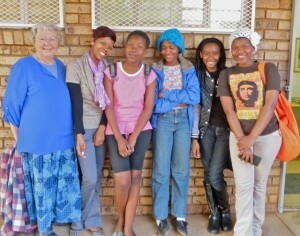 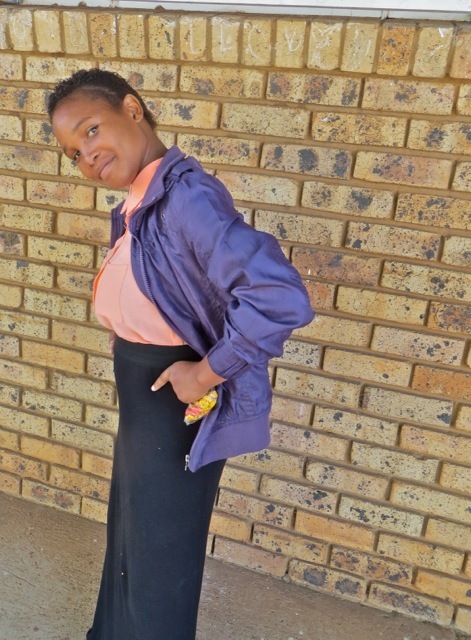 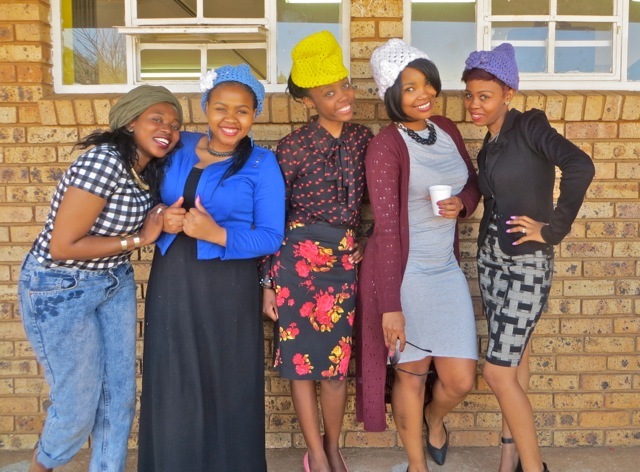 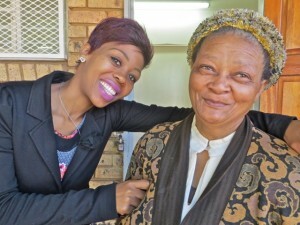 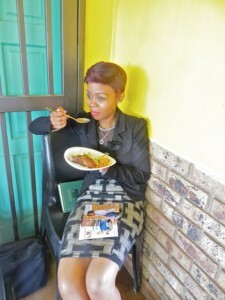 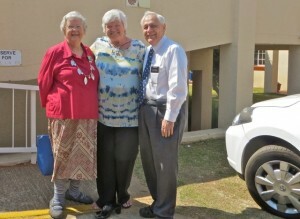 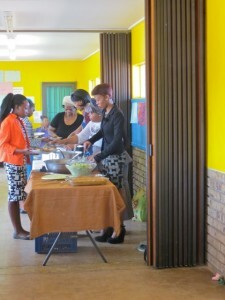 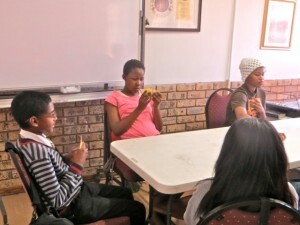 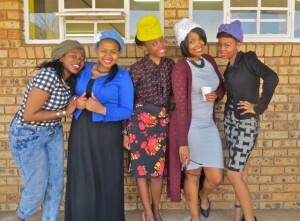 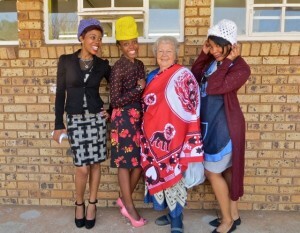 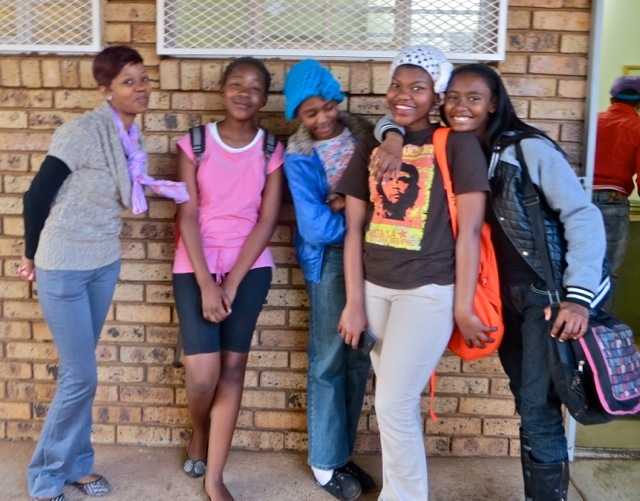 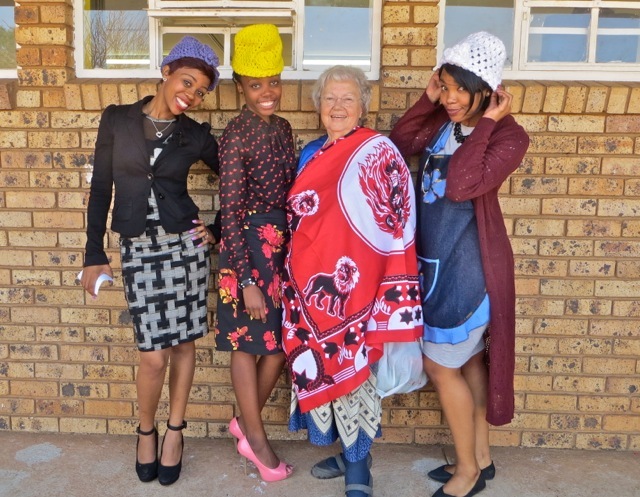 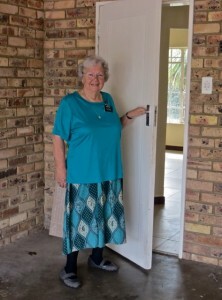 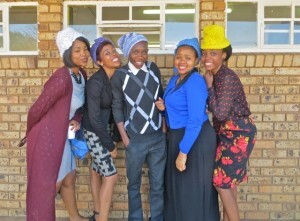 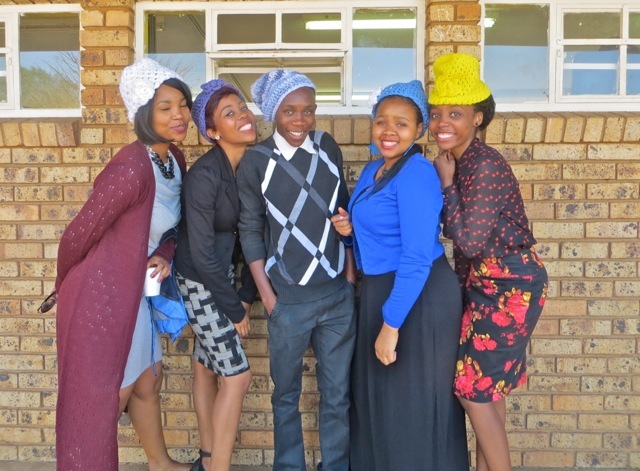 Then it was time to take some pictures – sister Ratema joined the young sisters. 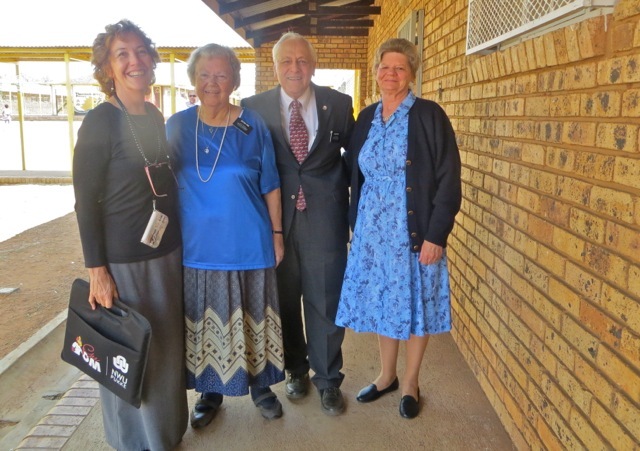 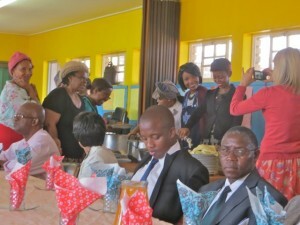 Then we added Mary, next came the YM and those who were helping with getting the building ready for Sunday and finally a always required crazy one…I love sister Kruger hiding behind sister Williams as well as Gomolemo’s big blue purse.